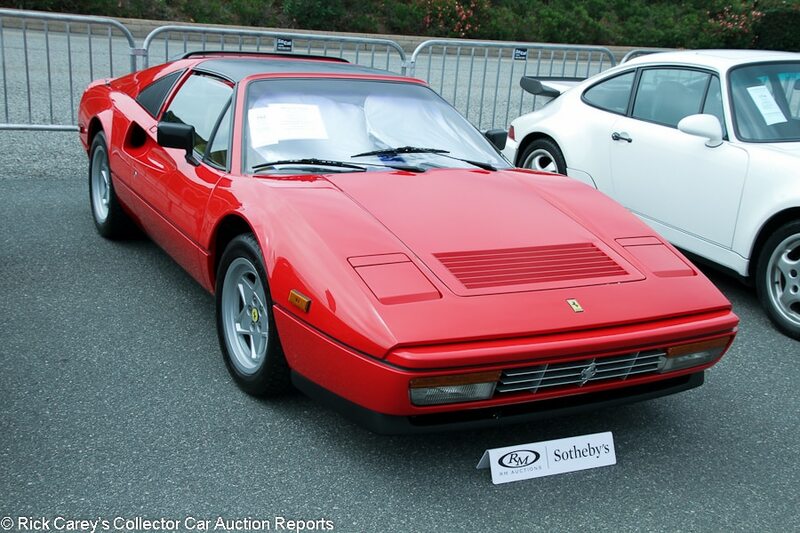 Yes, that says “RM Sotheby’s”, not Auctions America. Santa Monica was started as an Auctions America sale. 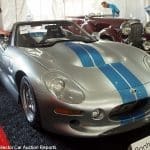 Its re-branding as RM Sotheby’s coincides with another RM Sotheby’s schedule change, the elimination of the sale at the Inn at St. John’s in Plymouth, Michigan during the Concours d’Elegance of America. Reasons? Draw your own conclusions from Gord Duff’s preface to the Santa Monica catalog. 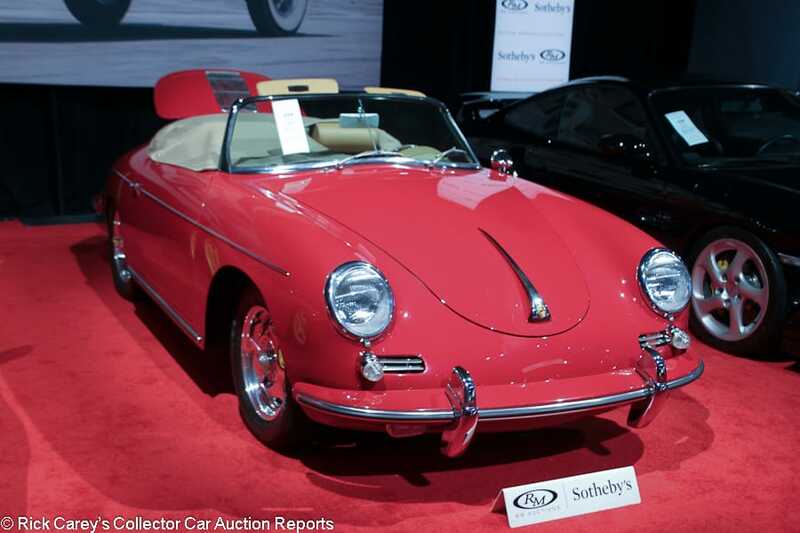 “RM Sotheby’s is thrilled to announce its collaborative new partnership with our sister company, Auctions America, and to host this year’s fifth annual Santa Monica sale…. RM is delighted to welcome the Auctions America team and its clients, and we look forward to further growing our partnership with this exciting highlight on SoCal’s collector car calendar.” Not that there ever was much separation between the RM Sotheby’s and Auctions America teams. The re-branding was most notable in the size of the consignment, down 32% from last year. On the other hand, 14 lots brought bids of $100K or more, and four lots were sold on hammer bids over $500K. The cars reported here were viewed on-site by Andrew Newton. Rick Carey is responsible for the final content and comments. 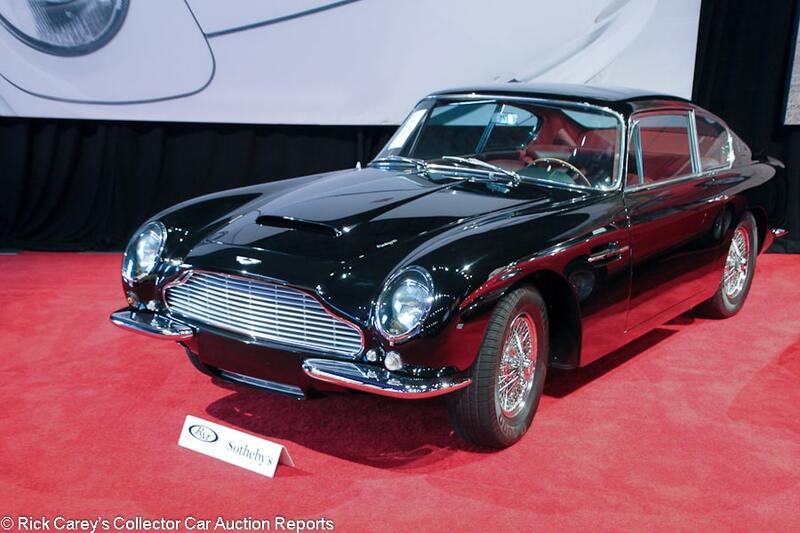 Lot # 191 1966 Aston Martin DB6 Vantage Coupe; S/N DB62754L; Black/Burgundy leather; Estimate $275,000 – $325,000; Cosmetic restoration, 2- condition; With Reserve; Hammered Sold at $310,000 plus commission of 10.00%; Final Price $341,000 – ZF 5-speed, triple Webers, chrome centerlock wire wheels, Pirelli tires, woodrim steering wheel, Becker Europa stereo, limited-slip, heated rear window, factory air conditioning. – Factory LHD car. Factory upgraded to Vantage specs after 27,000 miles from its original base engine and automatic transmission. Good older paint and chrome. Very tidy underneath, but not totally restored. Lightly scratched window frames. Light wrinkling to the seats but otherwise very good interior. Straightforward, light restoration work, but not exquisite. – Hammered not sold at RM Sotheby’s Arizona back in January at a $285,000 high bid. RM significantly adjusted their presale estimate this time around to accurately reflect what this car is and isn’t. The seller holding out for more wound up paying off this time around, with strong but appropriate money paid for a car with desirable air conditioning. 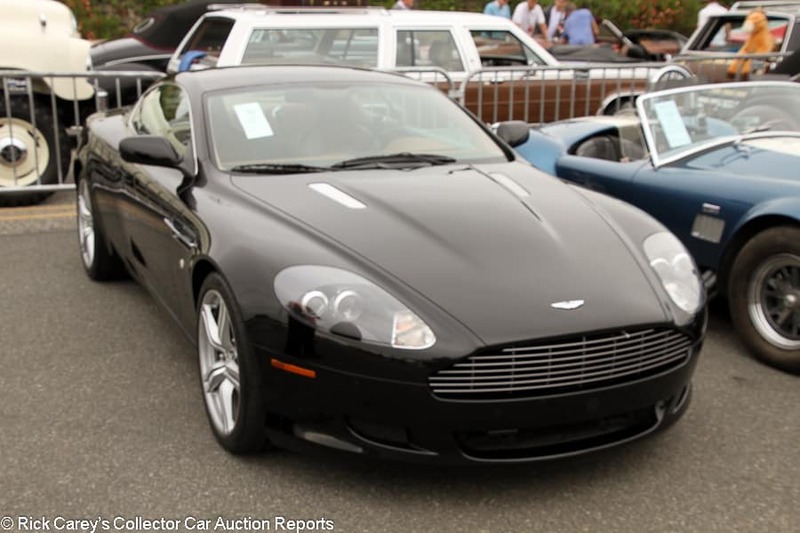 Lot # 208 2008 Aston Martin DB9 Coupe; S/N SCFAB01A98GA10264; Black/Brown leather; Estimate $90,000 – $110,000; Unrestored original, 2 condition; With Reserve; Not sold at Hammer bid of $55,000 – 6-speed, slotted rotors, Michelin Pilot Sport tires, tinted glass, factory CD stereo, power windows, climate control. – Rare manual transmission. The wheels are a little dirty. Clear bra on the nose. Very good paint. Very good interior with some smudges from fingers on some of the controls. It could use a good detailing, but this essentially presents like a new car and is showing 24,738 miles. – Still a used car and not yet a collectible, and Aston Martins depreciate like few other cars. Even so, this one is a solid low-mileage example with the much more desirable 6-speed manual gearbox, so the reported high bid here is a bit light. 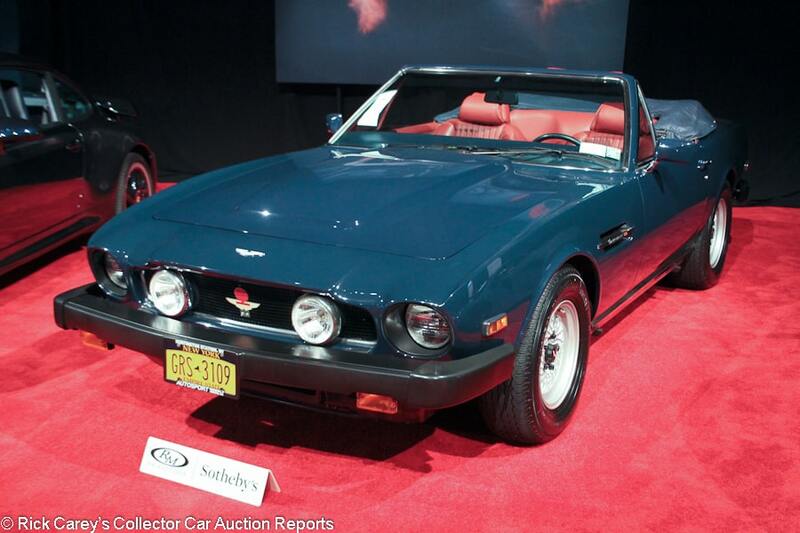 Lot # 204 1984 Aston Martin V8 Volante; S/N SCFCV81C2ETL15346; Portland Blue/Burgundy leather; Estimate $210,000 – $240,000; Unrestored original, 2- condition; With Reserve; Not sold at Hammer bid of $205,000 – Automatic, BBS wheels, Avon tires, blue leather boot cover, cassette stereo, power windows, air conditioning, wood interior trim. – Two-owner car with special order paint which is a little swirled but without blemishes. The tires look new. Cracking in the varnish on the console and dash, but otherwise the interior is very well kept. Very tidy underneath. A lightly used Aston, showing just 3,880 miles from new. – Wait, what? Bid to within $5,000 of the low estimate and not sold? RM couldn’t give back $5,000 of the buyer’s commission to make the deal? This makes no sense and the car should have sold. 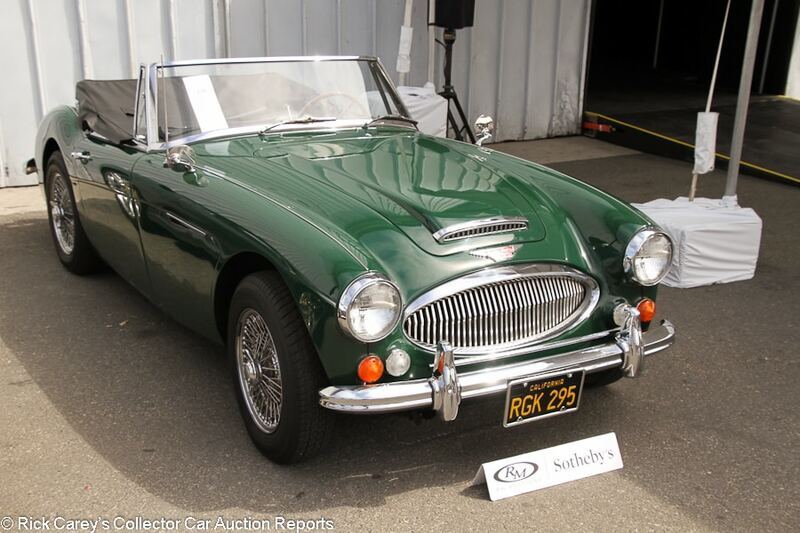 Lot # 236 1967 Austin-Healey 3000 Mk III Phase 2 Convertible; S/N HBJ8L40966; Green/Black; Black top; Estimate $75,000 – $95,000; Older restoration, 2- condition; With Reserve; Hammered Sold at $50,000 plus commission of 10.00%; Final Price $55,000 – Centerlock wire wheels, dual mirrors, black vinyl tonneau cover, Moto-Lita woodrim steering wheel, overdrive, Motorola pushbutton radio. – The chrome is a little dull. Very good older paint other than a long scratch down the trunk lid. Good, lightly worn interior. Tidy underneath. Fully restored in 1996 and it’s starting to show its age, but has no apparent needs. – For an attractive, well kept example that has been fully restored, even twenty years ago, this was a great buy. This money would typically buy an ordinary driver, but this car is better than that. 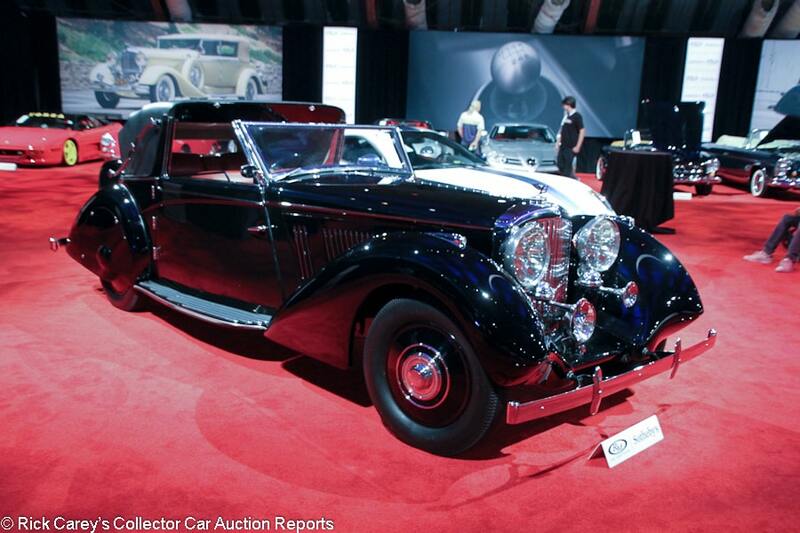 Lot # 212 1936 Bentley 3 1/2 Liter Sedanca Coupe, Body by Windovers; S/N B111FC; Black/Burgundy leather; Estimate $275,000 – $325,000; Older restoration, 2- condition; With Reserve; Hammered Sold at $182,500 plus commission of 10.00%; Final Price $200,750 – Body color wheel discs, spats, suicide doors, Flying B mascot, dual chrome horns, wood interior trim, enclosed rear-mounted spare, driving light, full tool kit. 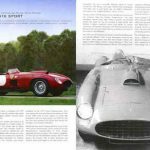 – Former Pebble Beach winner with one-off coachwork by Windovers. Shown at Pebble in 1983, then restored again and shown there in 1993 before going to the Blackhawk Collection until 2002, when it was shown at Pebble again in 2003. Chrome and brightwork has lost some shine but it is still good. The same goes for the paint. Visibly worn seats but the rest of the interior is very good. A well maintained older concours car. – Sold by RM at Amelia in 2014 for $374,000 and offered at Arizona this January where it was bid to a reported $270,000. The consignor must be thinking wistfully of that lost opportunity. The new owner, however, is now the proud possessor of a Bentley with unusual coachwork and features and an exceptional concours record at a relatively modest price. A good value. Lot # 197 1991 BMW 850i Coupe; S/N WBAEG2317MCB72189; Red/Beige leather; Estimate $25,000 – $35,000; Unrestored original, 2- condition; With Reserve; Hammered Sold at $18,000 plus commission of 10.00%; Final Price $19,800 – Automatic, BBS wheels, factory car phone, factory cassette stereo, power windows, air conditioning, sunroof. – There is a rub through in the paint at the very front of the hood and a handful of tiny chips on the nose but otherwise very good original paint. The sunroof doesn’t sit straight. Excellent interior that doesn’t show the kind of wear you’d expect from looking at the 55,512 miles on the odometer. No representation of service records, but it looks like a mostly pampered 850. – A $90,000 car when new, and not yet a full-blown collector car, the 850 represents one of the more affordable entries into the V-12 club. There is no such thing as a cheap 12-cylinder BMW, but the buyer here at least paid a reasonable price for a seemingly good car, provided it doesn’t have any immediate needs. 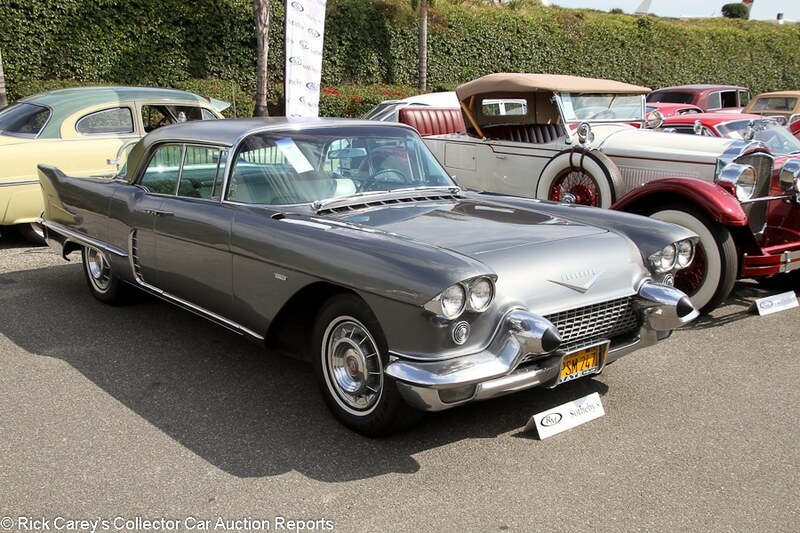 Lot # 181 1957 Cadillac Eldorado Brougham 4-Dr. Hardtop; S/N 5770089009; Deauville Gray, Brushed steel roof/White, Black leather; Estimate $75,000 – $85,000; Visually maintained, largely original, 3+ condition; With Reserve; Hammered Sold at $65,000 plus commission of 10.00%; Final Price $71,500 – Wheel covers, narrow whitewalls, Autronic Eye, coil springs to replace original air suspension, air conditioning, pushbutton radio. – Gaps are uneven everywhere. Several cracks around the edges of the hood. Chips around the door edges. Dull bumpers and brightwork. Long scratch on the front bumperette. Light restoration work underneath at some point. Small dent in the left rear fender. Small dent in the roof. Wavy dash top. Dull original dash and switchgear. Good, lightly worn seats. Maintained, but not totally original. – Bid to only $35,000 at Mecum’s Anaheim sale last November, the consignor should be overjoyed at this result, even under the pre-sale estimate range. It’s not a lot for what it is, but it is a lot for its erratic condition. 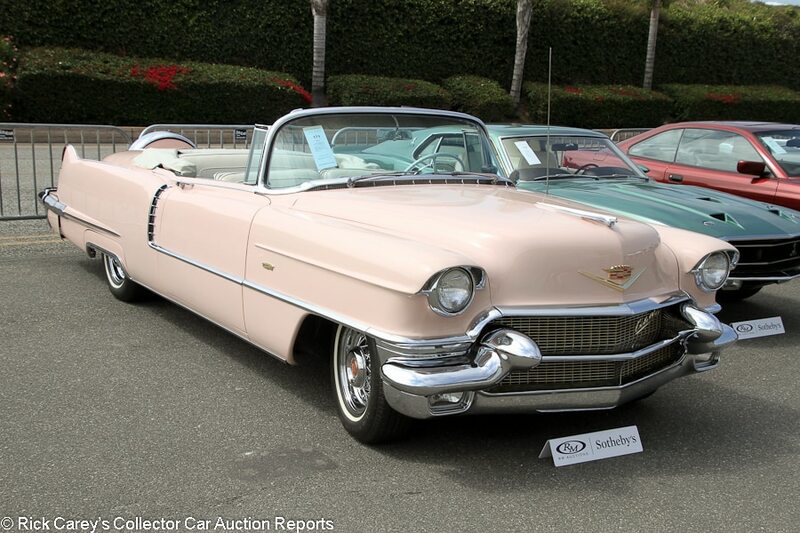 Lot # 171 1956 Cadillac Series 62 Convertible; S/N 5662045126; Mountain Laurel/White, Black leather; Estimate $70,000 – $80,000; Older restoration, 3+ condition; With Reserve; Hammered Sold at $65,000 plus commission of 10.00%; Final Price $71,500 – Wire wheels, narrow whitewalls, fender skirts, Continental kit, white leather boot cover, Autronic Eye, power steering, power brakes, pushbutton radio, dash clock, power windows, power top. – Very good paint and chrome other than a few chips around the door edges. Good restored brightwork other than original badges. Rubber trim is hanging loose on the right rear. Lightly worn seats. Slightly dull original dash, gauges, radio and switchgear. Older restored engine bay and underbody. An attractive car, but no stunner. – The interesting color helps make this car even more appealing (there’s little more intriguing than saying “I own a Pink Cadillac”) and it is as fully equipped as most ’56 Eldorados. 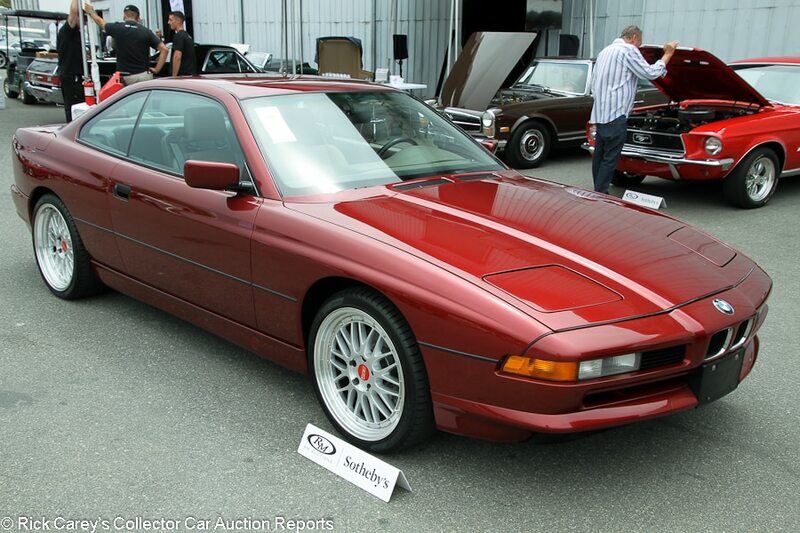 The successful bidder paid a full price for it, but still only a little more than half as much as a comparable Eldo. 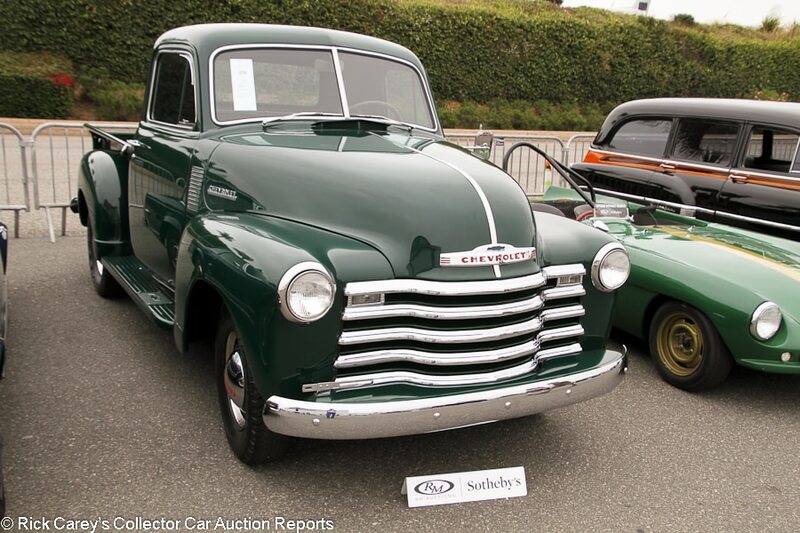 Lot # 256 1951 Chevrolet 3100 Pickup; S/N JBA593391; Dark Green/Black vinyl; Estimate $25,000 – $30,000; Recent restoration, 2 condition; With Reserve; Hammered Sold at $25,000 plus commission of 10.00%; Final Price $27,500 – 217/92hp 6-cylinder, 3-speed, hub caps and trim rings, wood bed, column shift. – Tiny chip on the right front fender. Light paint run on the right rear fender. Slightly uneven door gaps. Otherwise it has excellent paint, chrome, interior, engine bay and chassis. Fully restored top to bottom and done to standards not seen on many cars, let alone old pickups. – This is big money for a six-cylinder Series 3100, but for the restoration of this this truck it was fully deserved. 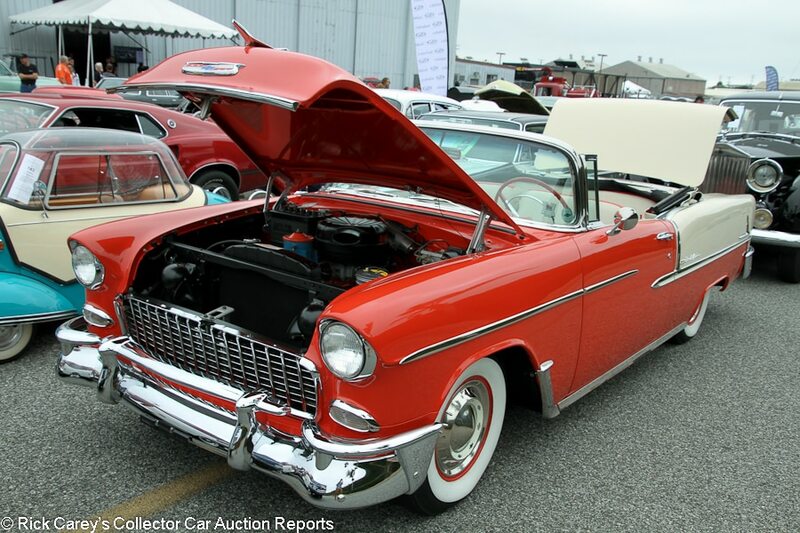 Lo t # 159 1955 Chevrolet Bel Air Convertible; S/N VC55K065888; Gypsy Red, Beige/Red, Beige vinyl; Beige vinyl top; Estimate $65,000 – $75,000; Older restoration, 2- condition; With Reserve; Hammered Sold at $50,000 plus commission of 10.00%; Final Price $55,000 – 265/180hp Power Pack, Powerglide, wheel covers, whitewalls, dash clock, pushbutton radio, tissue dispenser, power top, power windows, power steering, power brakes. – Very good, lightly run restored engine bay. Very good paint and chrome. Very light discoloration to the seats that might clean out. Very well equipped and got the kind of restoration work it deserved. It’s been lightly used since and shows 807 miles on the odometer, consistent with its post-restoration condition. – Sold by Leake in Tulsa in June 2014 for $72,600, then by Mecum in Dallas in 2014 for $75,600. It depreciated a little at Mecum’s Houston auction in April of 2016 where it brought $67,100 and now sold here at a very advantageous price for the new owner. It is a classic Shoebox Chevy in period correct colors that needs nothing but some TLC. 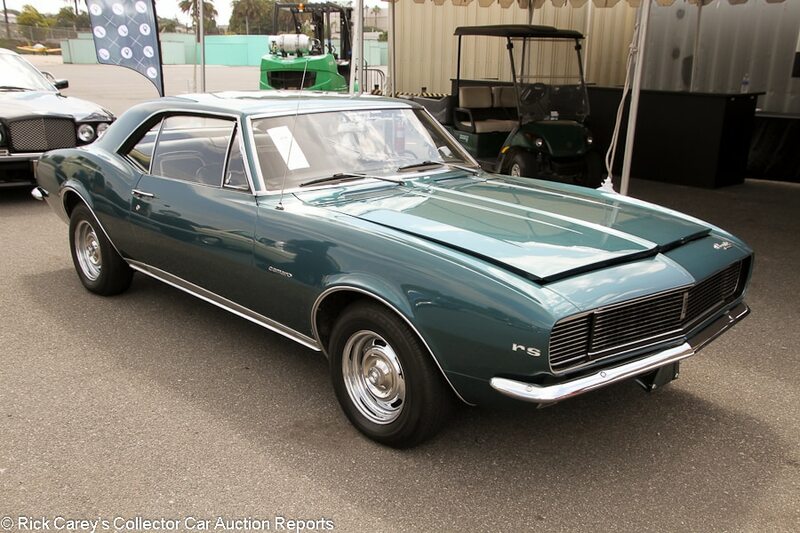 Lot # 254 1967 Chevrolet Camaro RS 2-Dr. Hardtop; S/N 123377L156799; Tahoe Turquoise/Black, White vinyl; Estimate $25,000 – $30,000; Cosmetic restoration, 3+ condition; No Reserve; Hammered Sold at $15,500 plus commission of 10.00%; Final Price $17,050 – 250/155hp six, automatic, console shift, factory radio, hidden headlights, RS package, Protect-O-Plate. – Represented as one owner, has its original documentation and shows 62,722 miles although no one is claiming it is still on the first time around. Very good paint and interior, although the original console is quite scratched up. Lightly worn underneath. Pitted window frames. The engine bay is maintained but tired. Cosmetically restored. – You almost never see six-cylinder Camaros of this vintage, but that doesn’t make them desirable. If this was an all-original very early production example that would be one thing, but as it sits there isn’t much appeal. It brought a strong price, though, and the seller should be happy to get so much for it. 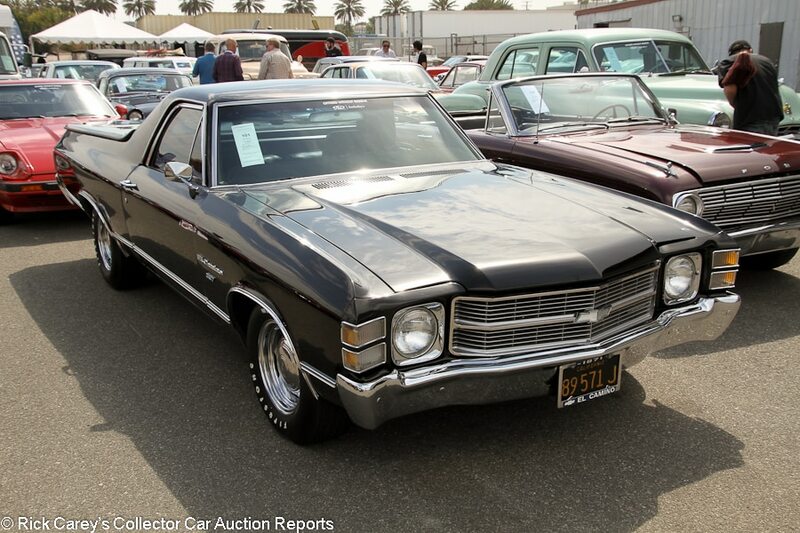 Lot # 101 1971 Chevrolet El Camino Pickup; S/N 136801K244434; Tuxedo Black/Black vinyl; Estimate $10,000 – $15,000; Enthusiast restoration, 3+ condition; No Reserve; Hammered Sold at $13,500 plus commission of 10.00%; Final Price $14,850 – 307, Edelbrock intake, four-barrel carb, spray in bed liner, Wide Oval tires, bed cover, dual mirrors, tinted glass, chromed wheels, sport steering wheel, column shift, Alpine CD stereo, air conditioning, power steering, power brakes. – Good older paint and chrome. Long scratch on the right front fender. Fender lips don’t quite fit right. Clean engine bay. Lightly worn restored interior. Very good underneath. Well restored to appropriate standards for what this car is but nothing extraordinary. – When you get up into the high-performance big-block cars, the El Camino represents a temptingly affordable alternative to the equivalent Chevelle. When it comes to the cheaper base models, though, the disparity isn’t as large and both models are quite affordable. Despite being the very first car in the sale, this one brought a perfectly appropriate price that both parties can be happy with. 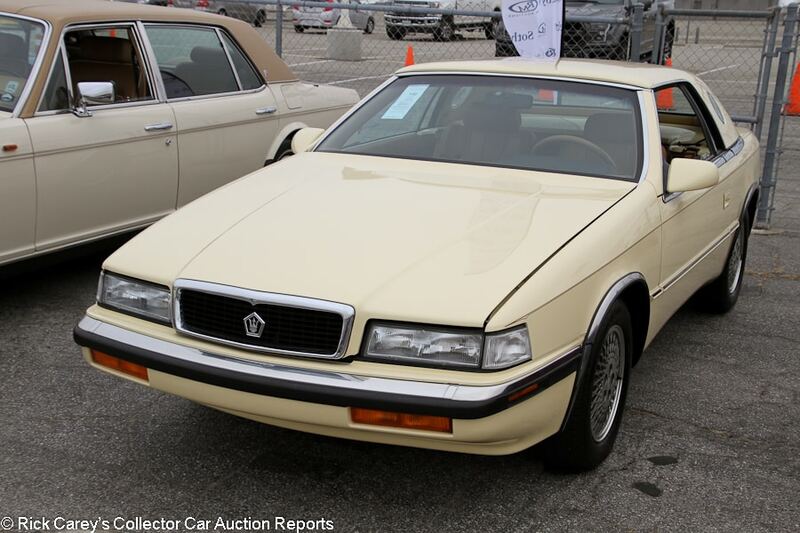 Lot # 132 1989 Chrysler TC by Maserati Convertible; S/N ZC2FP1108KB203892; Beige, Beige hardtop/Tan leather; Estimate $10,000 – $15,000; Visually maintained, largely original, 2- condition; With Reserve; Hammered Sold at $10,500 plus commission of 10.00%; Final Price $11,550 – 2.2/160hp intercooled turbo engine, automatic, Michelin tires, air conditioning, power windows, wood interior trim, two tops. – The interior looks almost new. There are a few small scratches in the front bumper. Very good repaint. The portholes on the hardtop are delaminating. Showing 4,921 believable miles represented to be from new. – An intercooled turbo K-car with different coachwork and Italian leather interior, this is probably the cheapest way to get the trident badge, although you won’t win any friends among the people who have real Maseratis. The result here reflects a modest and realistic premium for the low miles and originality. 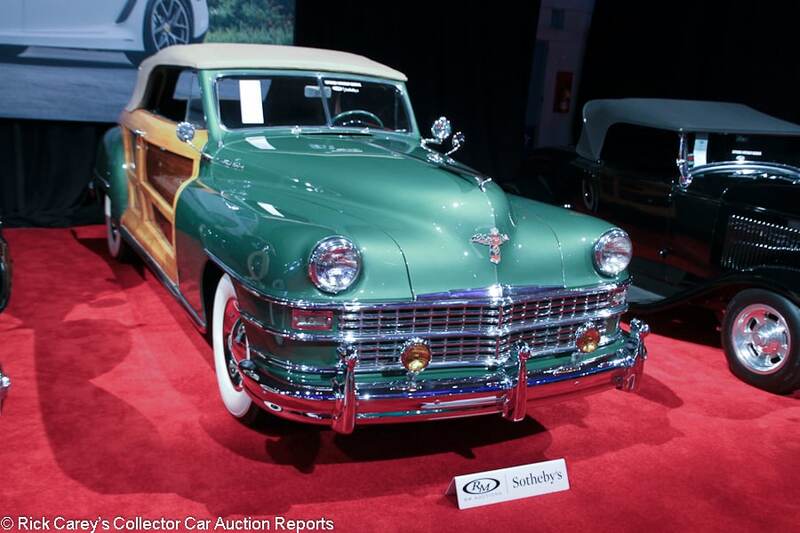 Lot # 188 1948 Chrysler Town & Country Convertible Coupe; S/N 7406635; Light Metallic Green, Wood/Green leather, Tan cloth; Tan cloth top; Estimate $100,000 – $140,000; Cosmetic restoration, 2- condition; No Reserve; Hammered Sold at $61,000 plus commission of 10.00%; Final Price $67,100 – Fluid Drive transmission, wheel covers, wide whitewalls, dual mirrors, GE spotlight, Town and Country radio, column shift. – Good newer top. All of the gaps are a little uneven. The wood is very good aside from a small crack in the driver’s door. The paint is very good aside from a few touched up chips on the left edge of the hood and another on the right front fender. Light wrinkling to the leather parts of the seats but otherwise very good restored interior. Original but very tidy underneath. CCCA Full Classic (TM) and a cosmetic restoration that still looks gorgeous. – Sold by Bonhams at Greenwich in 2008 for $150,000 and every bit as good today as it was then and showing only 301 more miles on the odometer, the new owner took home a bargain of major proportions in this No Reserve transaction. It may not be worth what it sold for nine years ago, but it is worth the low estimate. 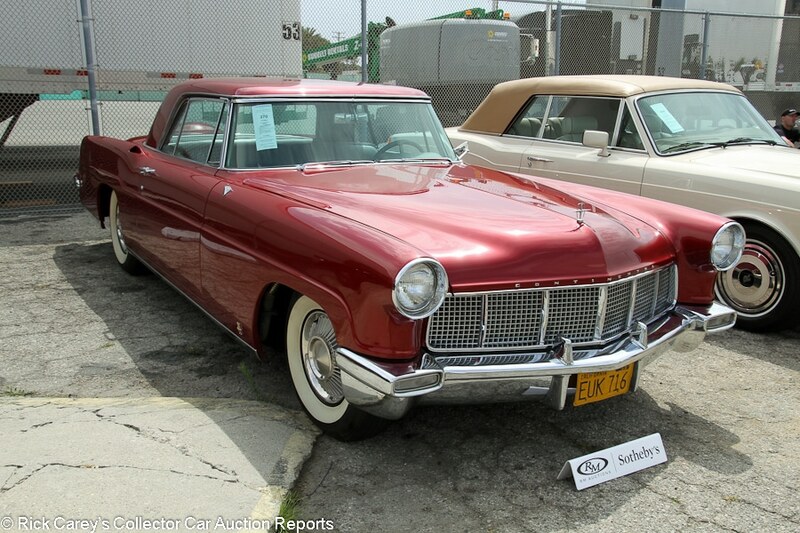 Lot # 270 1956 Continental Mark 2 2-Dr. Hardtop; S/N C56C2392; Red/Gray leather with Red cloth inserts; Estimate $45,000 – $55,000; Older restoration, 3- condition; With Reserve; Hammered Sold at $24,000 plus commission of 10.00%; Final Price $26,400 – Wheel covers, whitewalls, column shift, pushbutton radio. – Two small blisters in the paint on the right front fender. Otherwise good older paint and chrome. The door fit is erratic on both sides. Tidy older restored engine bay and underbody. Dirty tires. Very good newer seats and headliner. The switchgear is a bit dull. An older restoration without much in the way of known history and noted “will require recommissioning”. – The old restoration takes this Mark 2 Continental out of the realm of Preservation cars and puts it firmly in re-restoration project territory. Its condition is sound enough to make that a reasonable prospect, even if it had brought a few dollars more. It is one of the prettiest cars ever. 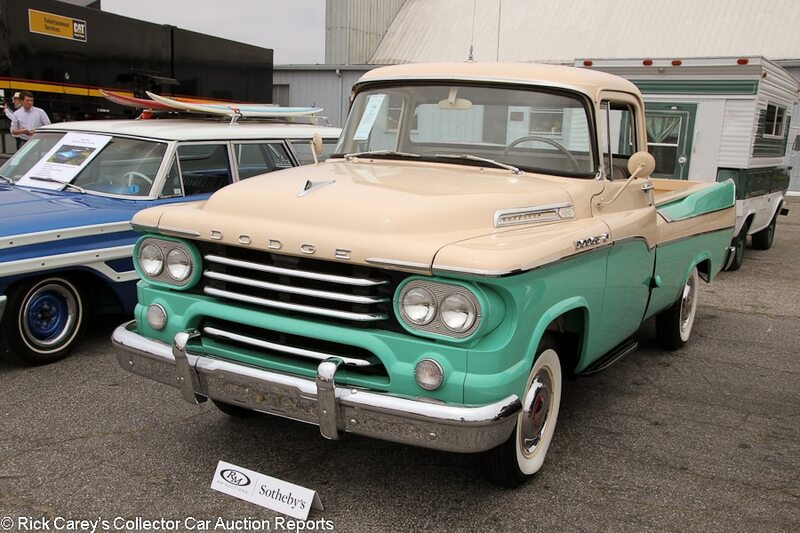 Lot # 116 1958 Dodge D100 Sweptside Pickup; S/N L8D1L16797; Teal, Beige/Beige vinyl with cloth inserts; Estimate $45,000 – $65,000; Recent restoration, 2 condition; With Reserve; Hammered Sold at $52,000 plus commission of 10.00%; Final Price $57,200 – 315/204hp 2-barrel Hemi, dual mirrors, wheel covers, whitewalls, pushbutton automatic, wood bed, radio. – Very good paint and chrome. The bed is spotless. There is light road wear on a fully restored underbody. Very clean engine bay. Very good interior. A rare, well equipped truck restored in attractive colors and done to very high standards. – At this point MoPar put Hemis in pretty much everything and that vastly increases their appeal as well as the justification for a restoration of this quality. 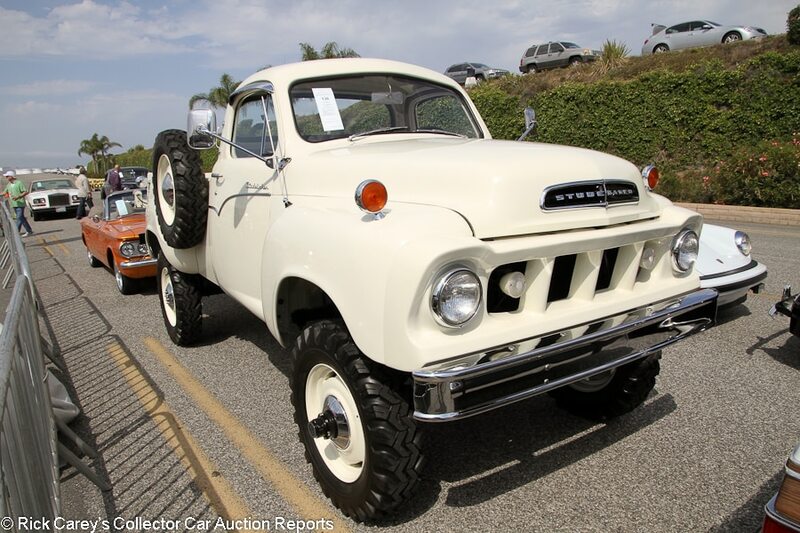 This is a spectacular truck in impeccable condition and it made its point with the Barker Hangar bidders, bringing a deserved superior price. 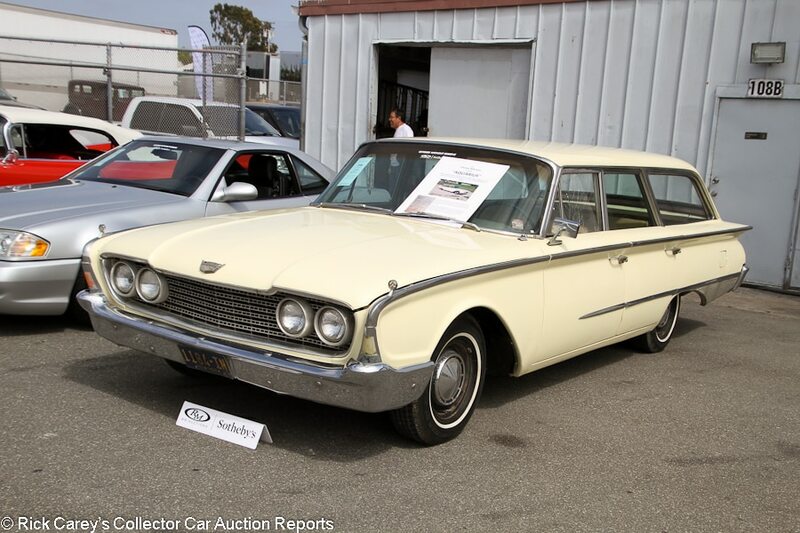 Lot # 140 1958 Edsel Ranger Villager Station Wagon; S/N W8UV724989; Dark Green, White/White, Green vinyl; Estimate $30,000 – $40,000; Recent restoration, 2- condition; No Reserve; Hammered Sold at $27,500 plus commission of 10.00%; Final Price $30,250 – 361/303hp, automatic, hub caps, whitewalls, Teletouch transmission, dual mirrors, pushbutton radio. – The headlight bezels aren’t straight. Paint chip right below the grille. Orange peel on the window pillars. Otherwise attractive paint. The paint around the steering wheel cap is wrinkling and the gauges are unrestored, but the rest of the interior looks great. Engine bay and underbody are very clean and well done. Uneven door gaps. Lots of money was spent on this rarely seen Villager wagon, but it’s still not a concours car. – There were a number of intriguing station wagons on the Santa Monica docket, indicative of the generally strong interest in our parents’ (or grandparents’) preferred pre-minivan transportation. Despite their numbers they generally, like this Edsel, brought appropriate money. 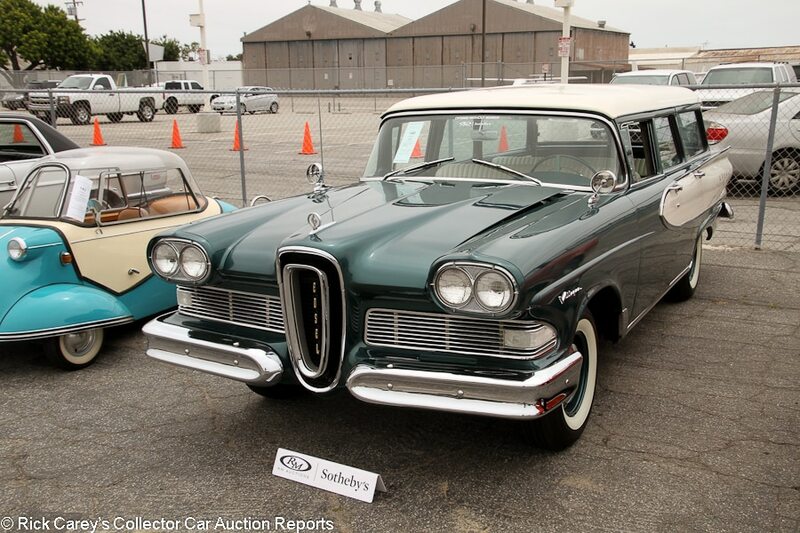 This Edsel would look good with surfboards on the roof. 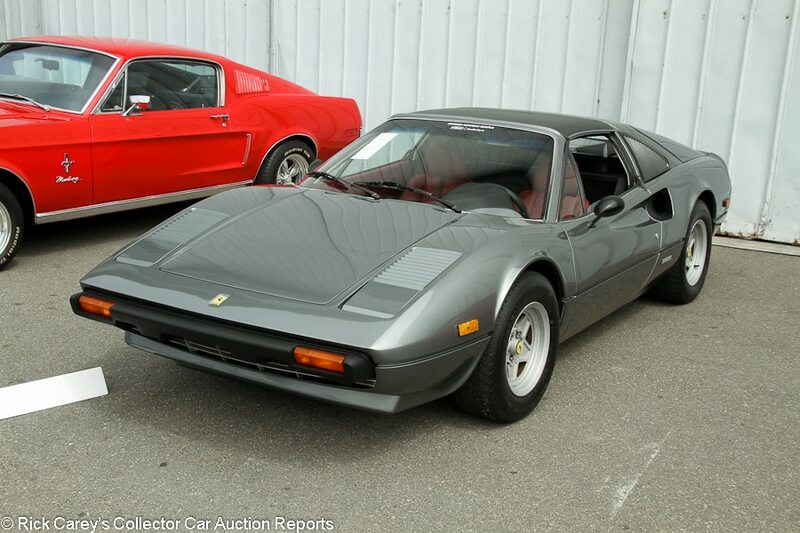 Lot # 215 1978 Ferrari 308 GTS Spider, Body by Pininfarina; S/N 24825; Grigio Ferro, Black vinyl/Red leather; Estimate $50,000 – $75,000; Visually maintained, largely original, 2- condition; No Reserve; Hammered Sold at $40,000 plus commission of 10.00%; Final Price $44,000 – Campagnolo wheels, store brand tires, Momo leather-wrapped steering wheel, power windows, air conditioning, Sony CD stereo. – Very good repaint. Good, lightly worn interior with some lightly faded switchgear. The wheels are a bit dull and dinged up. Showing 75,376 miles. There is no history represented with this car and it has significant mileage, but it’s a seemingly solid early carbureted example in attractive unconventional colors. – Discounted appropriately for lack of a history, relatively high miles and repaint. Lot # 182 1987 Ferrari 328 GTS Spider, Body by Pininfarina; S/N ZFFXA20A0H0074175; Rosso Corsa, Black vinyl/Tan leather; Estimate $80,000 – $95,000; Unrestored original, 2 condition; With Reserve; Not sold at Hammer bid of $65,000 – Power windows, air conditioning, Momo leather-wrapped steering wheel, later Blaupunkt CD stereo, power windows. – Tidy touch up on the nose, but otherwise immaculate original paint. The interior looks just about new. Well kept and showing 28,774 probably original miles, although there is no representation of service history. – An engine out service is expensive, and that is factored into the bidders’ willingness to step up for this 328. The seller can decide to take the money, or pay for the service, document it fully, and hope to reap a value closer to the pre-sale estimate. 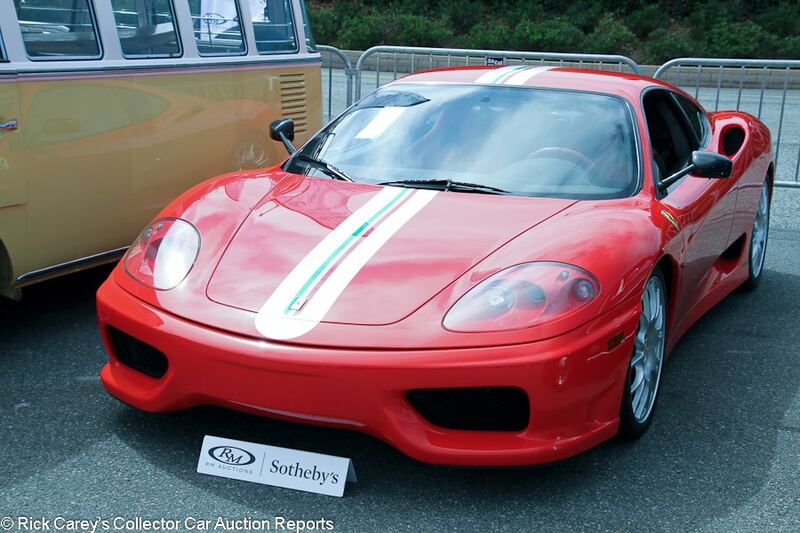 Lot # 202 2004 Ferrari 360 Challenge Stradale Coupe, Body by Pininfarina; S/N ZFFDU57A640136965; Rosso Scuderia, Challenge stripes/Red Alcantara; Estimate $190,000 – $215,000; Unrestored original, 2 condition; With Reserve; Not sold at Hammer bid of $165,000 – Carbon brakes, red calipers. – Recent service. Very tiny chip in the nose. Otherwise, it looks new. Represented with 13,000 miles. – The Challenge Stradale featured enhanced handling and braking as well as improvements in braking and a 20hp bump over the standard car. About 350 came to the US, and they had an MSRP of about 200 grand. These days, the going rate seems to be about what they cost new or slightly more, meaning that the reported high bid for this very good example wasn’t really high enough to be considered. Lot # 223 2004 Ferrari 360 Spider Convertible, Body by Pininfarina; S/N ZFFYT53A740135415; Argento/Dark Blue leather; Dark Blue cloth top; Estimate $130,000 – $150,000; Unrestored original, 2- condition; With Reserve; Not sold at Hammer bid of $120,000 – Modular wheels, 6-speed manual transmission, power windows, air conditioning, power top. – Represented with a recent service and showing 10,365 miles. Clear bra on the nose. Light wear on the seats. The top could stand to be cleaned. The enticement of the 6-speed manual is more than enough to make up for the small cosmetic flaws. – 6-speeds command a premium, but barely if any more than the reported high bid. 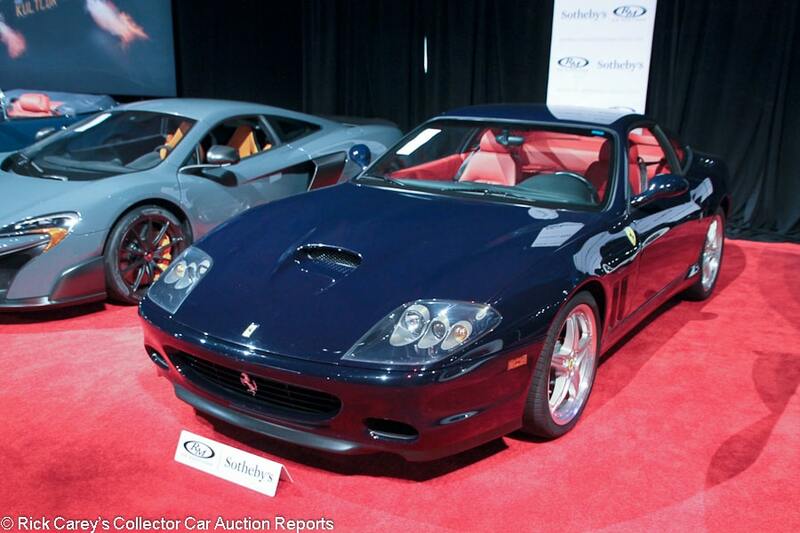 Lot # 210 2003 Ferrari 575M Maranello Coupe; S/N ZFFBV55A730131554; Blu Pozzi/Red leather; Estimate $150,000 – $175,000; Unrestored original, 2- condition; With Reserve; Not sold at Hammer bid of $135,000 – F1 6-speed, Fiorano handling package, Fiorano two-piece wheels, Pirelli tires, paddle shifters, power Daytona-style seats. – Recent PPI inspection as well as a belt, water pump and fluids service. There is a handful of chips on the nose and the driver’s seat is a little flat, but otherwise it’s a very well maintained car, represented with 11,000 miles and finished in arguably the most attractive color combination on these cars. – Sold at Mecum Houston this year for $165,000 ($150,000 hammer), which was probably a little more than half of what it cost new with these options but still an appropriate number, so the reported high bid here was considerably short of being reasonable. 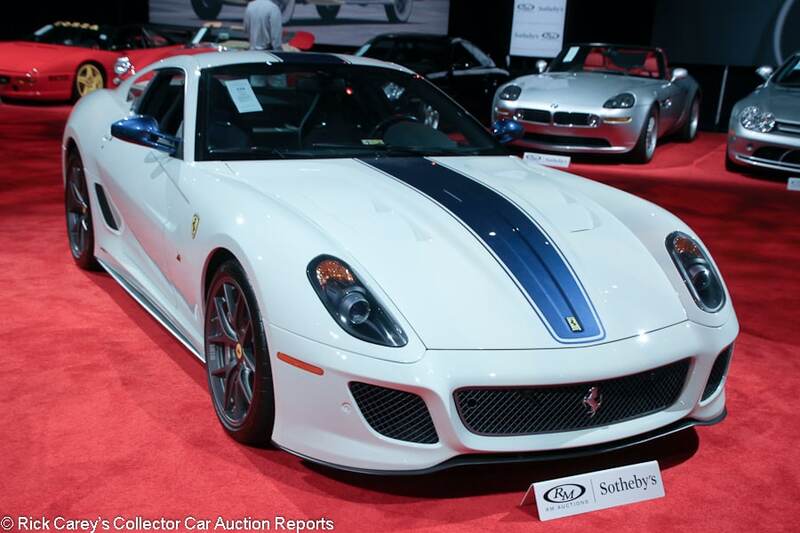 Lot # 226 2011 Ferrari 599 GTO Coupe, Body by Pininfarina; S/N ZFF70RCA2B0177029; Bianco Avus, Blue stripe/Blu Scuro with suede inserts; Estimate $650,000 – $750,000; Unrestored original, 2 condition; With Reserve; Not sold at Hammer bid of $600,000 – 5,999/670hp, F1 gearbox, Michelin Pilot Super Sport tires, cross-drilled carbon brakes, carbon fiber interior trim, Bose stereo, navigation system, power windows, air conditioning, aluminum calipers, power seats. – One of 125 599 GTOs for the US market. Represented with 2,739 miles. It still looks like a new car. – It seems like no 599 GTO has more than a couple thousand miles, and the last three sold at auction all closed at all-in prices under $500,000 – for Euro models, however, not US-spec versions. 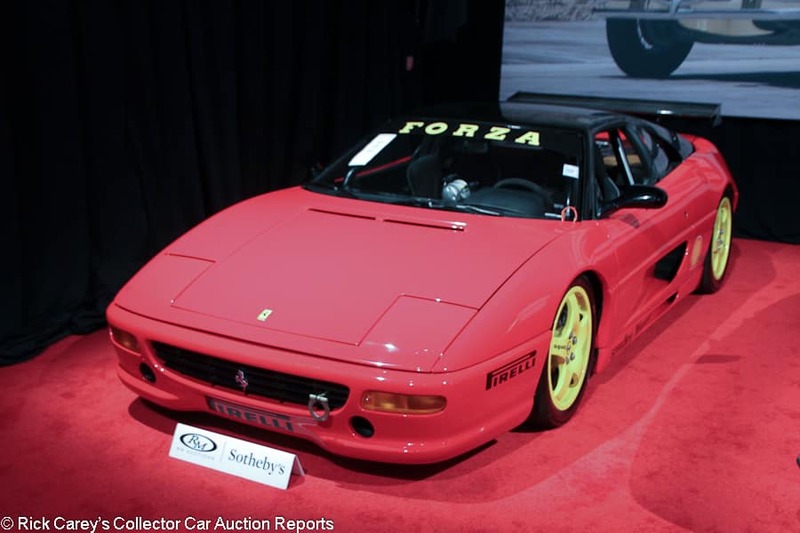 Lot # 233 1995 Ferrari F355 Challenge Berlinetta, Body by Pininfarina; S/N ZFFPR41A6S0104404; Red, Black roof, Yellow wheels/Black; Estimate $120,000 – $160,000; Visually maintained, largely original, 2- condition; With Reserve; Not sold at Hammer bid of $105,000 – Speedline wheels, carbon fiber wing, roll cage, Sabelt harnesses. – Campaigned in 1997 and 1998. The red portion of the body has been repainted, but the mirrors have lots of chips on them from time on the track. Tidy underneath. Shown at a few concours events. A used race car cleaned up for a sale, but it’s also a late model Ferrari track car with a manual gearbox, and that’s fairly special. – Let’s hope the seller gave serious consideration to the reported high bid on this F355 Challenge as its age, condition and miles don’t make it worth any more than this. 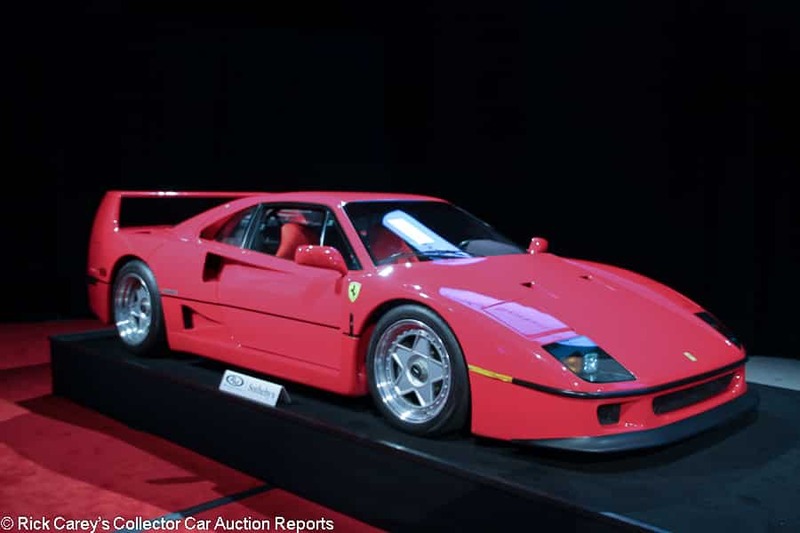 Lot # 229 1992 Ferrari F40 Berlinetta; S/N ZFFMN34A7N0093065; Rosso Corsa/Red cloth; Estimate $900,000 – $1,100,000; Visually maintained, largely original, 2 condition; With Reserve; Hammered Sold at $870,000 plus commission of 10.00%; Final Price $957,000 – Air conditioning, Tubi exhaust, aftermarket turbos, Pilot Sport tires, later Ferrari stereo. – US delivery model. Recently serviced. Several scratches on the wheels. Large chip right below the grille and another touched up chip on the right side of the tail. The interior is good. Showing 15,888 miles. Objectively it isn’t a bad car, but in the world of F40s its condition is below average, the mileage is above average and the modifications are another hindrance to value. – The seller should be entirely happy with this result, as should RM. 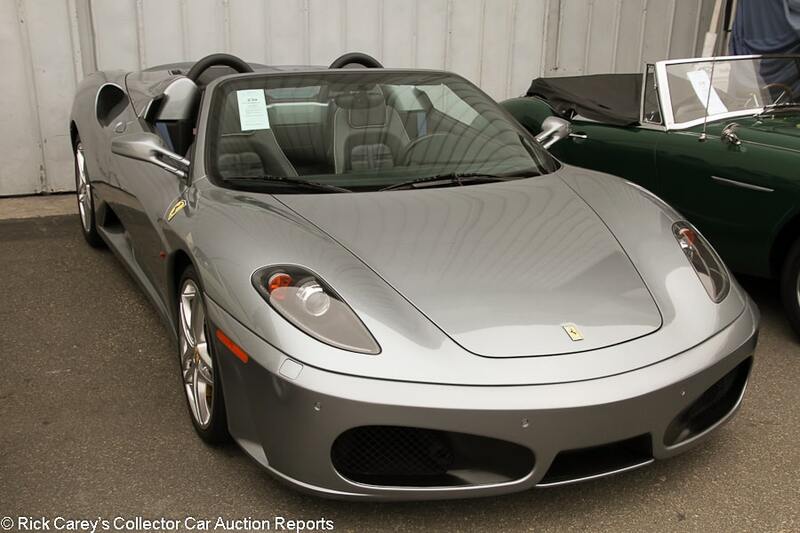 Lot # 238 2008 Ferrari F430 Spider; S/N ZFFEW59A180162987; Titanium Gray/Blue Scuro leather piped in Gray; Estimate $100,000 – $130,000; Unrestored original, 2 condition; With Reserve; Hammered Sold at $90,000 plus commission of 10.00%; Final Price $99,000 – F1 gearbox, carbon-trimmed steering wheel, Challenge grille, Daytona seats. – Represented with a clean CARFAX and service records. Showing 27,971 and looks like a new car other than negligible wear to the driver’s seat. 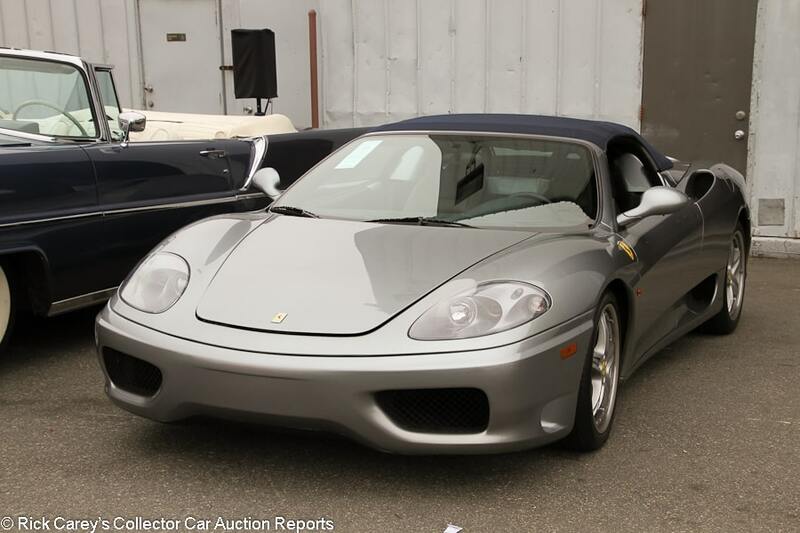 – The F430 is still in used car territory, trading for well under its $200,000-plus MSRP. This result was on the cheap side compared to other examples currently on the market, but it wasn’t a steal. 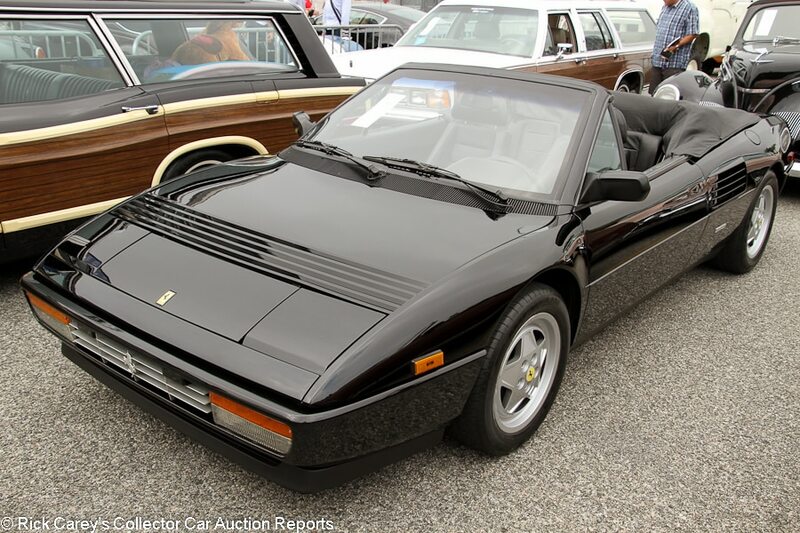 Lot # 150 1989 Ferrari Mondial T Cabriolet; S/N ZFFFC33A7K0082563; Black/Black leather; Black top; Estimate $55,000 – $65,000; Unrestored original, 2 condition; With Reserve; Hammered Sold at $37,000 plus commission of 10.00%; Final Price $40,700 – Black leather boot cover, power windows, air conditioning, cassette stereo. – Represented with an engine out service, but not when the work was done. Very good original paint. Wear to the seats corresponding with the 19,936 miles showing, but otherwise the interior looks new. This is very good for a Mondial. Apparently bought new by Michael Douglas’s first wife, who wasn’t really famous for anything else. – Mondials have long been the cheap, unloved Ferrari, so there are many of them that have not enjoyed the typical pampered Ferrari life. This one has, though. The price was slightly on the expensive side, but not entirely unjustified, and was likely more down to the impressive condition rather than any Hollywood connection. 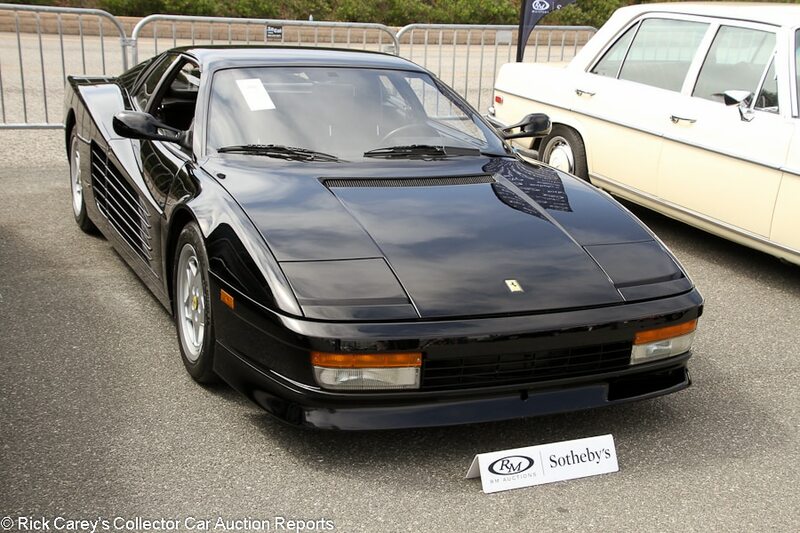 Lot # 203 1990 Ferrari Testarossa Coupe, Body by Pininfarina; S/N ZFFSM17A8L0082891; Black/Black leather; Estimate $105,000 – $125,000; Unrestored original, 2- condition; With Reserve; Not sold at Hammer bid of $90,000 – Clear bra on the nose, Momo leather-wrapped steering wheel, power windows, air conditioning. – A few painted over chips on the bottom lip and some light wear to the driver’s seat are the only real signs of age. Showing 19,984 claimed original miles. Fully serviced back in January. – The consignor wouldn’t be unreasonable to expect a six-figure bid for this mostly excellent TR. Lot # 246 1960 Ford Country Sedan Station Wagon, 6-pass. ; S/N 0F64V169478; Light Yellow/Tan vinyl; Estimate $8,000 – $10,000; Unrestored original, 4 condition; No Reserve; Hammered Sold at $3,000 plus commission of 10.00%; Final Price $3,300 – Six-cylinder engine, automatic, hub caps, narrow whitewalls. – Dull original paint. Wavy body sides. Large chips and scratches on the hood. Dry window gaskets. Huge cracks in the driver’s window. Dull interior with decent seats but the door panels and rear cargo area are falling apart. Surface rust underneath and on the wheels. Used in the TV Series Aquarius. – Nobody seemed to care about this car’s status as a former TV prop and instead bid it to a price appropriate for what it is: a tired, sparsely equipped old station wagon. 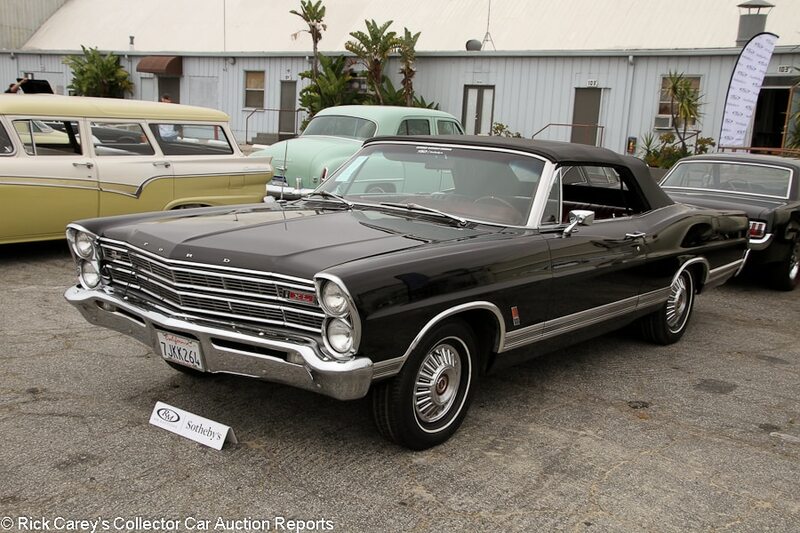 Lot # 131 1967 Ford Galaxie 500 XL Convertible; S/N 7G59Q151021; Raven Black/Red vinyl; Black vinyl top; Estimate $30,000 – $35,000; Visually maintained, largely original, 3+ condition; No Reserve; Hammered Sold at $18,000 plus commission of 10.00%; Final Price $19,800 – 428/345hp, automatic, wheel covers, narrow whitewalls, power steering, power brakes, power top, bucket seats, console shift, under dash gauges, later cassette stereo. – Good redone bumper chrome. The other brightwork is lightly scratched and pitted. Good newer top. A handful of paint chips on the passenger’s door. The trunk lid bows out at the back. The XL badge on the tail is scratched up. Good newer seats and carpets. The rest of the interior is original but decent apart from a vinyl cover that was crudely glued onto the dash top. Sound and dry but unrestored engine bay and underbody. Desirably equipped car in attractive colors, but still only in driver condition. – There are a number of things this Q-code Galaxie convertible needs, none of them particularly serious but all of them visible and taken together seriously hurting its value. The new owner got a rare engine package and a car whose value can be appreciably enhanced by addressing its simpler, and more visible, issues. It is a sound value at this price. 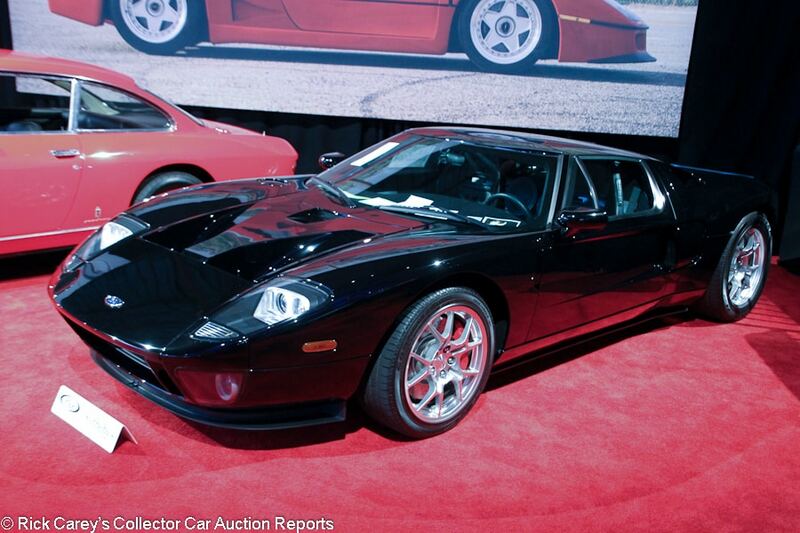 Lot # 222 2005 Ford GT Coupe; S/N 1FAFP90S05Y401249; Black/Black; Estimate $275,000 – $325,000; Unrestored original, 2 condition; With Reserve; Not sold at Hammer bid of $250,000 – Red calipers, BBS wheels, McIntosh stereo, stripe delete. – Represented with 5,800 miles and looks like a new car. Signatures under the hood from the people who built the car as well as Bill Ford and Steve Saleen. – Not sold at Mecum Kissimmee this year at a $250,000 high bid then a month later in Pomona for $275,000. GT prices are no longer on the rise, this car has more miles than many others, and the market has spoken three times now with similar bids, so it may be time to let it go. Right now there’s a strong risk that the consignor missed the Ford GT window and is chasing a declining Ford GT market. 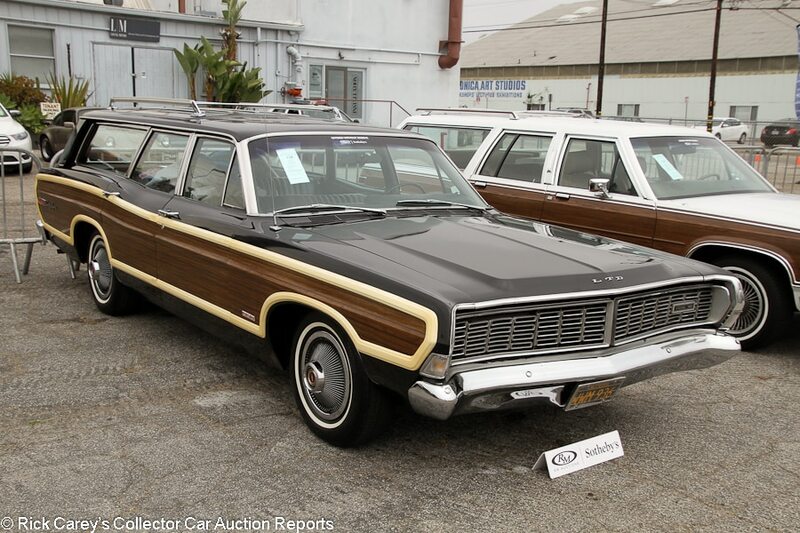 Lot # 134 1968 Ford LTD Country Squire Station Wagon, 6-pass. ; S/N 8J75Y168487; Black, Woodgrain/Black vinyl; Estimate $15,000 – $20,000; Visually maintained, largely original, 3+ condition; No Reserve; Hammered Sold at $16,000 plus commission of 10.00%; Final Price $17,600 – 390/265hp, automatic, wheel covers, narrow whitewalls, roof rack, air conditioning, power steering, power brakes, power rear window, bench seats, Philco radio. – Body side trim is yellowing and warped. Sound older repaint. Decent but dull original chrome and brightwork. Light pitting on the roof rack. Uneven gaps. The upholstery and carpets look like they were replaced a while ago. The dash is original but sound. Tidy undercoated chassis. Certainly not perfect, but it’s a long-time California car that has gotten restoration work where it counts, and you hardly ever see these cars in any condition anymore. – This car got a lot of attention during the preview, as did the other neat vintage station wagons in the sale. The price paid here was absolutely on the expensive side, but it’s justifiable when you think about how hard it will be to find another one this good or this well preserved. 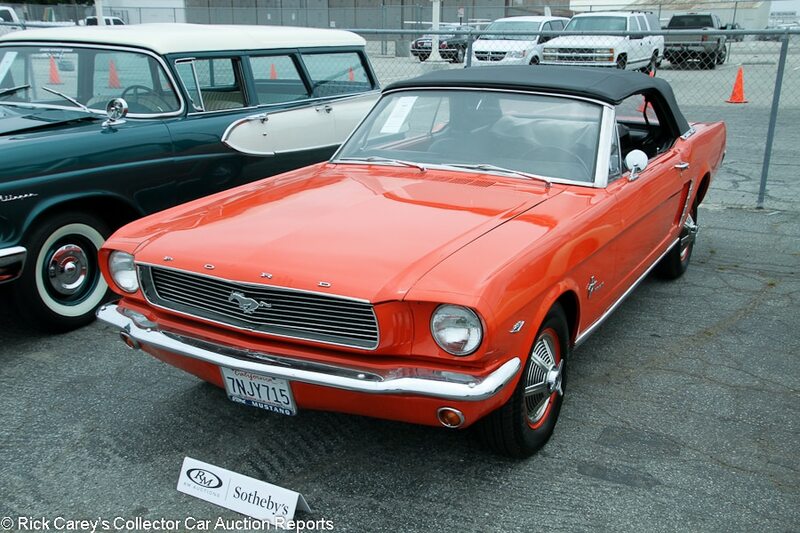 Lot # 141 1965 Ford Mustang Convertible; S/N 5F08D111107; Orange/Black vinyl; Black vinyl top; Estimate $30,000 – $40,000; Enthusiast restoration, 3 condition; With Reserve; Hammered Sold at $18,000 plus commission of 10.00%; Final Price $19,800 – 289/210hp, 4-speed, centerlock style wheels, black vinyl boot cover, power brakes, later JVC cassette stereo. – Good older replacement top. Decent chrome. Older budget respray with a few runs around the grille. Dull brightwork. The rocker trim isn’t flush. Dull, faded original dash. The rest of the interior was restored, but there is lots of orange peel on the inside of the doors and quick budget undercoating on the frame. Clean engine bay. A basic driver quality ’65 Mustang convertible. 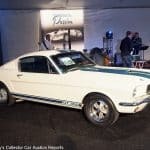 – This car’s lackluster presentation really didn’t do it any favors in an auction with several other and better first generation Mustangs. The buyer should be happy, though, having won the car at a price that leaves money for needed cosmetic work. As for the seller, the car was offered with reserve so the decision to accept this bid must also reflect the seller’s opinion of its value. 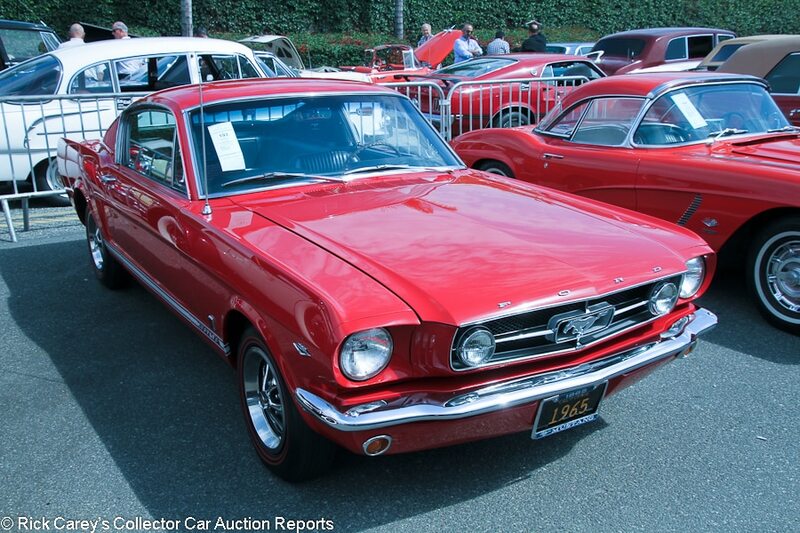 Lot # 193 1965 Ford Mustang GT Fastback; S/N 5R09A233558; Rangoon Red, White/Black vinyl; Estimate $45,000 – $50,000; Recent restoration, 2 condition; With Reserve; Hammered Sold at $41,000 plus commission of 10.00%; Final Price $45,100 – 289/225hp, 4-speed, red line tires, Pony interior, Hurst shifter, factory radio. – A genuine GT represented to have 71,206 miles from new. Very good paint, bumpers and brightwork other than light orange peel on the headlight bezels. Tidy, fully restored engine bay and underbody. Very good restored interior. A freshly and competently restored car done to high but not excessive standards and needs nothing. – Sold for $37,800 at Mecum Seattle 2015. This result was a bit on the expensive side for an A-code car, but it wasn’t crazy money. 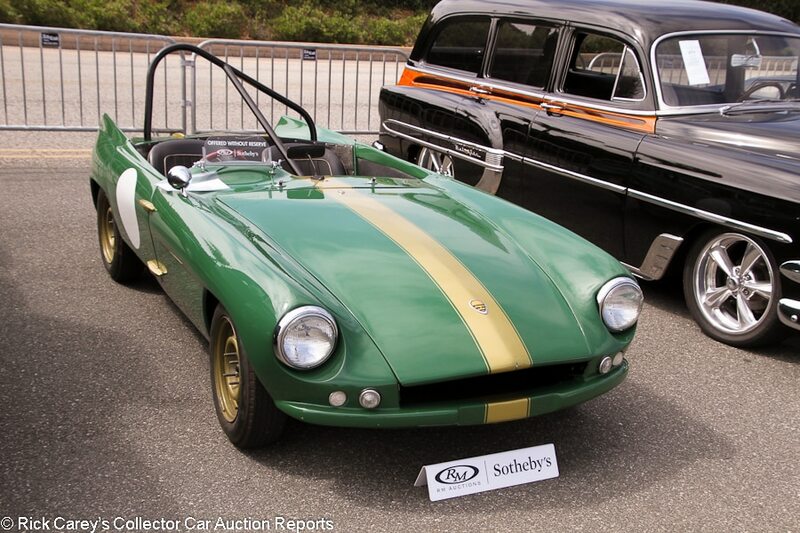 Lot # 219 1953 GSM Dart Roadster; S/N 61200204; Green, Gold stripe/Black vinyl; Estimate $15,000 – $20,000; Competition restoration, 3+ condition; No Reserve; Hammered Sold at $10,000 plus commission of 10.00%; Final Price $11,000 – Alfa Romeo twin cam 1300 engine, dual Webers, side exhaust, steel wheels, Dunlop Racing tires, roll bar, aluminum radiator, racing harnesses. – Paint cracks around where the windshield used to be. Cracks and chips in various other places, but the bodywork itself is in sound shape. Tidy engine bay. Lightly used interior. Repainted chassis. Restored for competition use and in used but decent condition. – Glass Sport Motors (GSM) was South Africa’s contribution to the world of sports cars in the 1950s and ’60s. The Cape Town-based outfit built the Dart sports car, an Elva Courier-like fiberglass sports car typically powered by Climax or Alfa Romeo engines. It’s the kind of car you can go your whole life without seeing in person. At this price and with a rev-happy Alfa 1300 under the hood, this was probably the most fun per dollar of the entire auction. 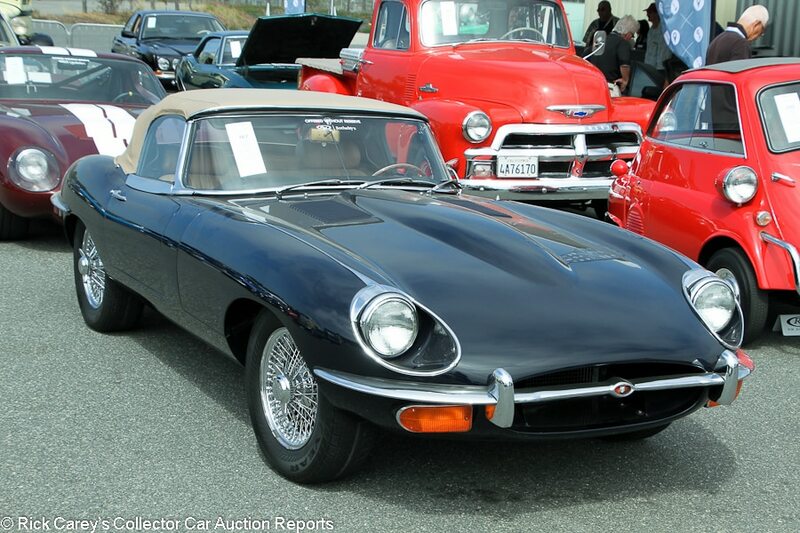 Lot # 167 1970 Jaguar XKE SII Roadster; S/N 1R12391E311870; Dark Blue/Tan leather; Tan cloth top; Estimate $70,000 – $90,000; Older restoration, 2- condition; With Reserve; Not sold at Hammer bid of $45,000 – Triple carbs, chrome centerlock wire wheels, woodrim steering wheel, dash clock, Alpine CD stereo. – Very small dent in the rear bumper and a crack at the bottom of the passenger’s door. Otherwise very good paint and chrome. Clean and restored underneath. Nearly spotless restored engine bay with three carbs instead of the usual two on an SII. Very good restored interior other than light pitting on the parking brake handle. Fully restored to standards that are good enough for an SII, but would fall short on an earlier, more valuable car. – This isn’t a perfect car, but it’s a lot better than the reported high bid. 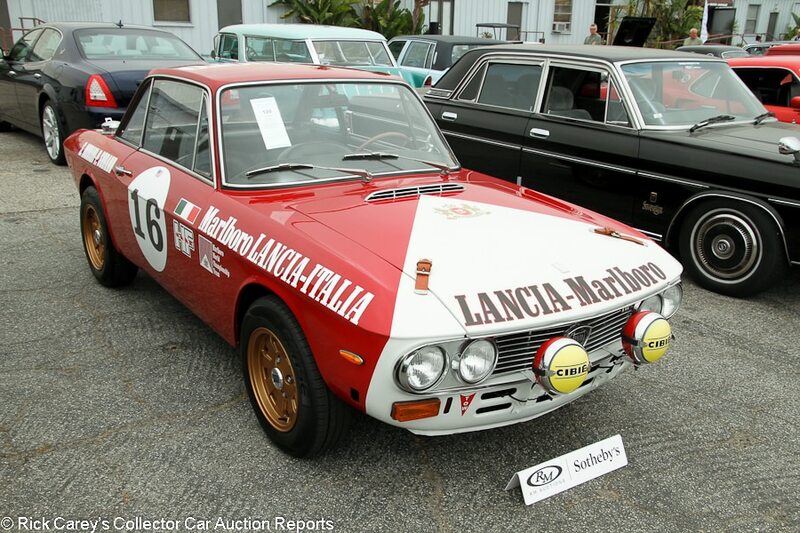 Lot # 120 1971 Lancia Fulvia 1.3 SI Coupe; S/N 818630012337; Red, White “Marlboro”/Black vinyl; Estimate $38,000 – $45,000; Facsimile restoration, 2- condition; With Reserve; Hammered Sold at $41,000 plus commission of 10.00%; Final Price $45,100 – 1,298/87hp, 5-speed, Cibie rally lights, leather hood straps, racing filler cap, woodrim steering wheel, gold magnesium wheels. – Uneven hood gaps and thebrightwork is a little dull. There are cracks in the edges of the wood dash. Good older paint. Not an actual rally car but a cool tribute with rebuilt engine, suspension and brakes with receipts for $40,000. Not perfect, but a neat choice for driving events and money has clearly been spent where it counts. – The Monaco Rally livery identifies this Fulvia as a traffic stop target. Painted like this a law enforcement professional would be reasonable to conclude: a) the driver is going too fast; or b) the driver is driving recklessly; or 3) it doesn’t meet road car regulations. This is a generous price in the U.S., but pales beside the Fulvia 1.3 HF prices at Duemila Route in Italy last year. Are Fulvia coupes a new fad? Time will tell. 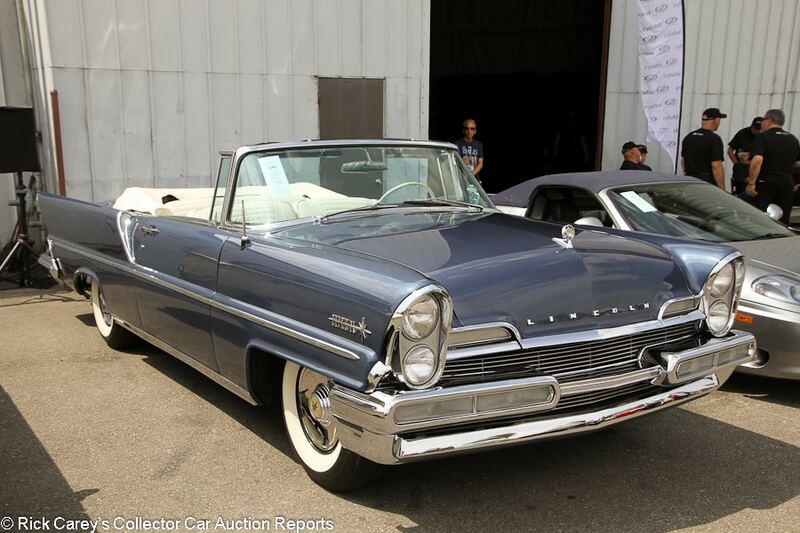 Lot # 247 1957 Lincoln Premiere Convertible; S/N 57WA39088L; Blue Metallic/White leather; Estimate $55,000 – $65,000; Older restoration, 3+ condition; With Reserve; Not sold at Hammer bid of $42,000 – 368/300hp, automatic, wheel covers, whitewalls, power steering, power brakes, power windows, power top, white leather boot cover, Town and Country radio, dash clock. – The passenger’s door sticks out a bit. There is a paint run on the right side of the nose. The rest of the paint isn’t great and the flake isn’t even. Good chrome. Cracking in the caps on the wheel covers. Restored and clean underneath. Trunk fit is erratic. A little warping on the dash and original gauges. Lightly worn restored interior. Restored and an attractive car, but not done to the standards that this car arguably deserves and now lightly aged on top of that. – This may have been the “Stunning restoration” mentioned in the catalog, but that was to the standards of years ago and more stringent standards and the passage of time make it no more than a presentable (big) driver today, for which the reported high bid was a reasonable offer. 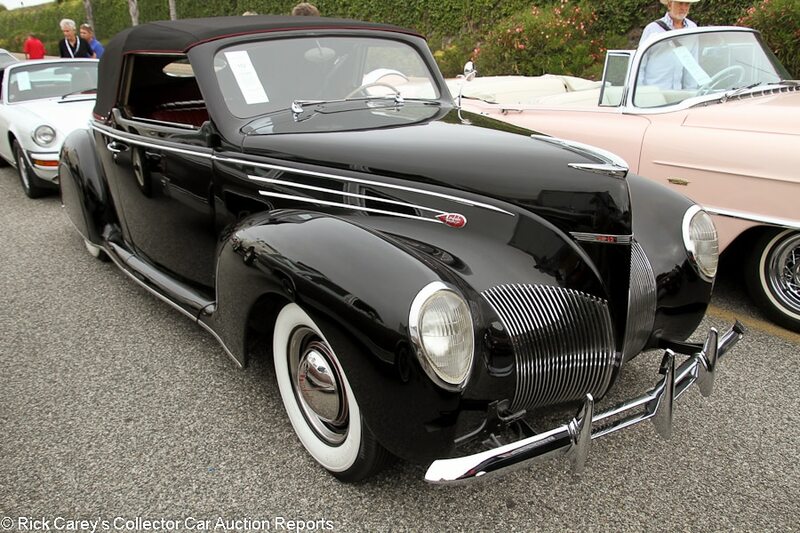 Lot # 152 1939 Lincoln Zephyr Convertible Coupe; S/N H84568; Black/Burgundy leather; Black cloth top; Estimate $80,000 – $100,000; Older restoration, 2- condition; With Reserve; Not sold at Hammer bid of $69,000 – Columbia 2-speed axle, hub caps and trim rings, Firestone wide whitewalls in front, Denman tires in the rear, fender skirts, dash clock, banjo steering wheel, lowered 3 inches in front. – Several cracks in the nose. A few scratches along the rockers as well. Otherwise good older paint. Good top. Very good interior with nearly no wear. Tidy underneath. An older restoration, but a well kept one. – One of the real advantages of the extra cubic inches of the Zephyr twelve is the torque to take advantage of an overdrive. The mild customizing enhances the streamlined, sleek Zephyr look and the presentation is quite good, if a little aged. The seller can be forgiven for not taking the reported high bid, but might have generated renewed interest with little risk by lifting the reserve. We’ll never know, until it turns up somewhere else. 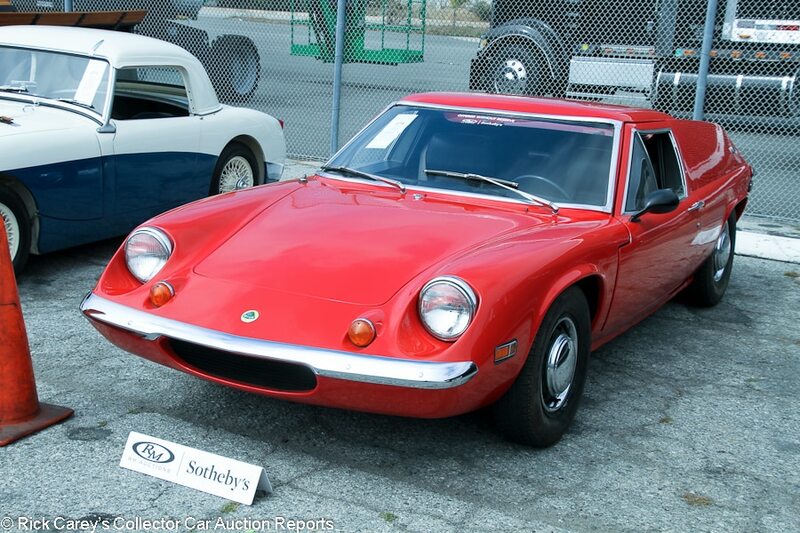 Lot # 278 1971 Lotus Europa S2 Coupe; S/N 7101020780R; Red/Black vinyl; Estimate $20,000 – $30,000; Visually maintained, largely original, 3 condition; No Reserve; Hammered Sold at $7,500 plus commission of 10.00%; Final Price $8,250 – Hub caps and trim rings, wood dash and shift knob, power windows, single Weber carburetor. – Good older paint other than a chip in the front of each door in the same spot. Tidy engine bay. Good newer chrome. Decent, mostly original interior but the steering wheel cap is cracked and the wood dash is warped and cracked all over. The tires are old and dirty. Underbody is unrestored and oxidized but maintained and there is no major rust visible. – The S2 Europa still has the Renault engine and poor rear visibility, but the windows open and the body is bolted to the frame rather than glued like the S1, which makes restoration a lot more straightforward. And while the Renault engine makes a lot less power than the later Lotus Twin Cam, it’s still plenty to push around a 1,400-pound car. This example has needs just as every Chapman-era Lotus does, but this price is a downright bargain and the new owner has a few grand left over for improvements. 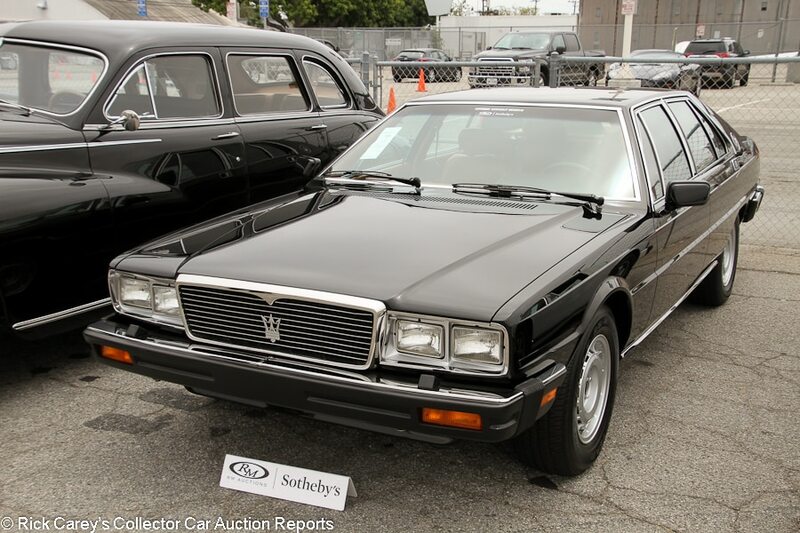 Lot # 154 1986 Maserati Quattroporte III 4-Dr. Sedan; S/N ZAMBC1102GA305830; Black/Brown leather; Estimate $50,000 – $60,000; Visually maintained, largely original, 2 condition; No Reserve; Hammered Sold at $40,000 plus commission of 10.00%; Final Price $44,000 – Campagnolo wheels, quadruple Webers, automatic, power windows, air conditioning, burled wood interior trim, later Kenwood stereo, tinted glass. – A few small but deep scratches on the front bumper. Very good older repaint. Very good interior with only very light wear to the original seats. Unrestored but nearly immaculate underneath. Not perfect, but these cars are notorious for being a hassle to keep running and few if any have been kept up with this well. 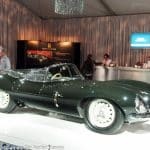 – This may be the best QP III in the world, and that is supported both by this result and the $39,600 this car sold for at Bonhams Scottsdale last year. 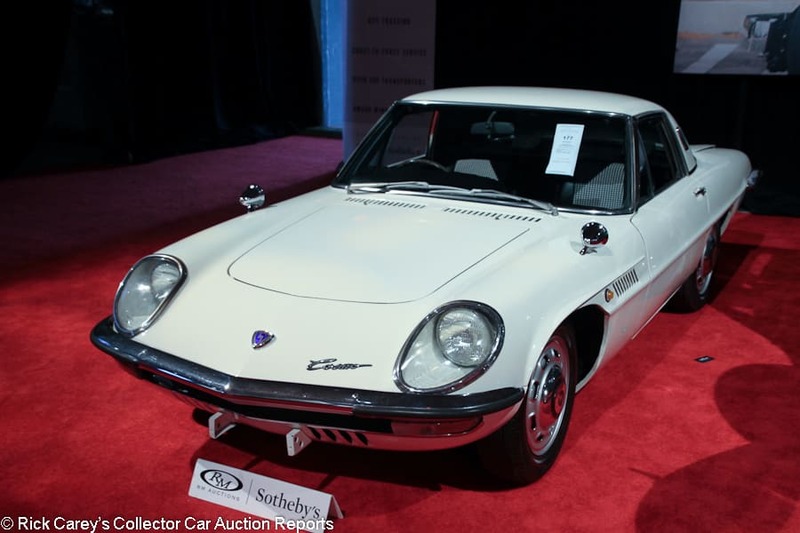 Lot # 177 1968 Mazda Cosmo Coupe; S/N L10A10322; White/Black vinyl with houndstooth cloth inserts; Estimate $110,000 – $130,000; Older restoration, 3+ condition; With Reserve; Not sold at Hammer bid of $80,000 – 982cc/128hp single rotor, 4-speed, steel wheels, Dunlop tires, dual wing mirrors, wood shift knob. – The interior absolutely reeks of Armor All, and all the vinyl surfaces are overly shiny and slick as a result. The dash top is wavy and there are some scratches on the transmission tunnel. The gauges are also original. The chrome is old and dull, as are the window frames. There are a few small dings in the wheels, a paint crack in the bottom of the B-pillar and a large chip below the driver’s window. Restored underneath. This one was restored quite a while ago, and likely done before these cars were worth very much. It is also a first series L10A model, which is considerably rarer and has slightly smaller wheels as well as a 4-speed instead of a 5-speed. – Values for the little Cosmo were pulled up by the big surge in prices for Toyota 2000 GTs. One even pulled over a quarter-million dollars at Gooding Pebble Beach in 2014. More recent auction results just haven’t been as high, and the reported high bid here was more in line now that prices have settled. 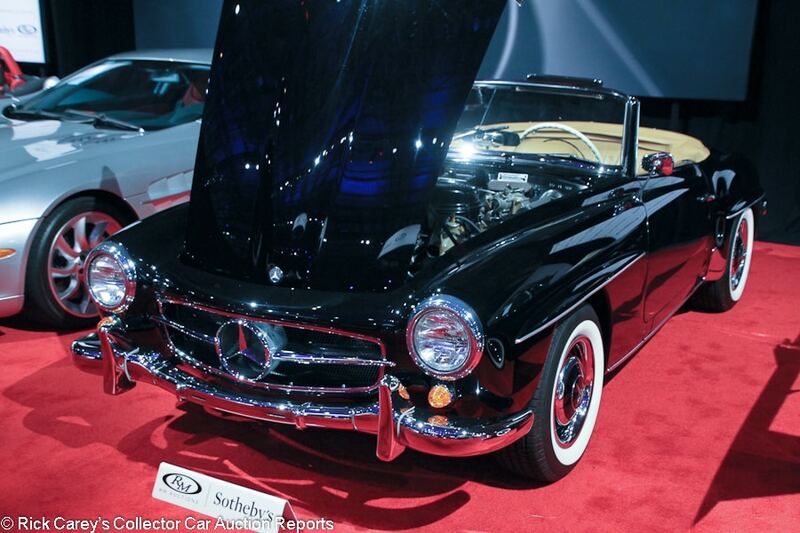 Lot # 160 1957 Mercedes-Benz 190SL Convertible; S/N 190SL121042; Black/Tan leather; Black top; Estimate $90,000 – $125,000; Recent restoration, 2 condition; With Reserve; Hammered Sold at $115,000 plus commission of 10.00%; Final Price $126,500 – Hub caps and trim rings, whitewalls, Becker Mexico stereo, heater, dash clock, tan leather boot cover. – Fully restored, lightly run engine bay. Very good paint, chrome and interior. Fully restored to high standards and still fresh enough to please anybody. – Now is a good time for 190SL buyers. They shot way up in value before peaking in 2015 and softening since. When they were on the rise, they got valuable enough that people started restoring them correctly and giving them all the attention and expense they deserved. The cars that did get high-dollar restorations are the ideal ones to buy now that they are more affordable, and this result is a good example. The car clearly had a lot of money spent on it and if this was 2015 it probably would have commanded closer to 200 grand. Back in 2003 it sold for $22,680 at Barrett-Jackson Scottsdale and the caliber of the restoration indicates it’s had all the difference in the then and now auction results invested in making it look this way. Lot # 178 1937 Mercedes-Benz 230 N Roadster; S/N 155124; Blue, Light Blue/Light Blue leather; Black cloth top; Estimate $200,000 – $250,000; Older restoration, 2- condition; With Reserve; Not sold at Hammer bid of $150,000 – 2,228cc/55hp single carb side valve six, 3-speed, suicide doors, dual sidemount spares, hub caps, engine turned dash, turn signals. – Mostly good but not show quality paint. Good restored engine bay but it’s been run. Discoloration and smudges on the seats. Clean restored frame. Delivered new to the German postal service. Attractive, fully restored car but not done to concours standards. Represented as one of possibly less than 30 examples built. – An unusual car in 1937, and far more unusual today, it has a story to tell and is dressed up for the rendition. On the other hand the 2.3 liter flathead six under the hood has only 55hp, not a lot of oomph even for this size car. The seller puts great weight on the rarity and condition but the bidders factored in the horsepower in arriving at this result. There are no comparables, so until a resolution is found “value” remains in the eyes of the respective parties and unresolved for the rest of the world. Lot # 234 1971 Mercedes-Benz 280SL Convertible; S/N 11304412020649; Tobacco, Tobacco hardtop/Cognac; Estimate $90,000 – $120,000; Cosmetic restoration, 2- condition; With Reserve; Not sold at Hammer bid of $45,000 – Automatic, wheel covers, blackwalls, hardtop only, VDO dash clock, aftermarket stereo. – Represented as 71,779 miles and three owners from new. Excellent newer paint. Very good chrome. Very good, mostly restored interior other than some wear on the wood console trim. The engine bay is a little grimy but presentable. Dry and tidy but unrestored underneath. A solid cosmetic restoration on a relatively rare California Coupe model, which deleted the soft top and added a small rear bench seat. – Pagoda SL prices have softened recently after a big run up over the past few years as they were dragged up with 190SL values, but they haven’t softened this much by a long shot. This is a good car that got offered project car money. 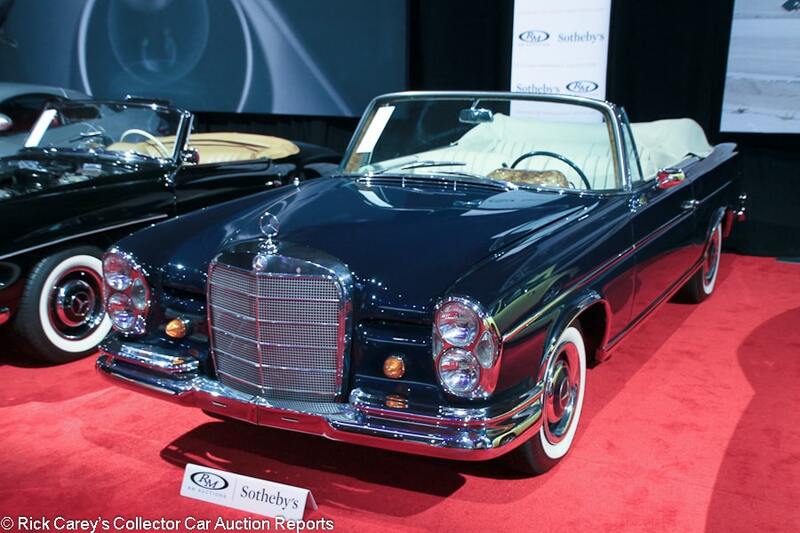 Lot # 221 1967 Mercedes-Benz 300SE Convertible; S/N 11202312009516; Dark Blue/Cream leather; Estimate $240,000 – $280,000; Older restoration, 2- condition; With Reserve; Not sold at Hammer bid of $180,000 – Hub caps and trim rings, whitewalls, leather boot cover, power windows, Becker Mexico radio, VDO dash clock, wood interior trim. – Decent older chrome. Very good older paint. Some paint is chipping off the steel wheels. Small chip on the left front fender. Light pitting on the window frames. Excellent interior with perfect leather and wood. Very tidy underneath with a detailed engine bay. Fully restored a while ago, but holding up quite well. – The 300SE was an important car for M-B but today collectors want the 111-series 3.5 V-8, a fact that the seller didn’t factor into the expectations equation. This bid should have bought it. 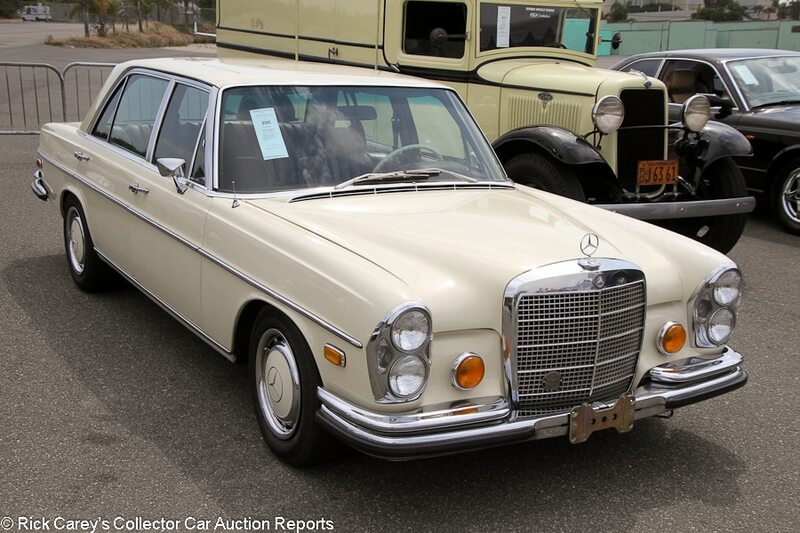 Lot # 206 1970 Mercedes-Benz 300SEL 6.3 4-Dr. Sedan; S/N 10901812003385; Cream/Burgundy leather; Estimate $45,000 – $55,000; Visually maintained, largely original, 2- condition; With Reserve; Hammered Sold at $38,000 plus commission of 10.00%; Final Price $41,800 – Wheel covers, sunroof, power windows, power steering, power brakes, VDO dash clock, Becker Mexico stereo, factory air conditioning. – The tires are old. The older repaint is very good other than a few chips around the headlights and a few small masking errors around the window frames. Very good, lightly worn unrestored interior with very good original wood. Tidy underneath. Represented with extensive (and expensive) service getting the car fully sorted, including the air suspension system. Never fully taken apart and restored, but it never needed to be. – The fastest sedan in the world when it came out, the 300 SEL 6.3 is cheaper and easier to live with than its 600 cousin even if it is a bit less grand, and this was a spot on result for an example in this kind of condition. 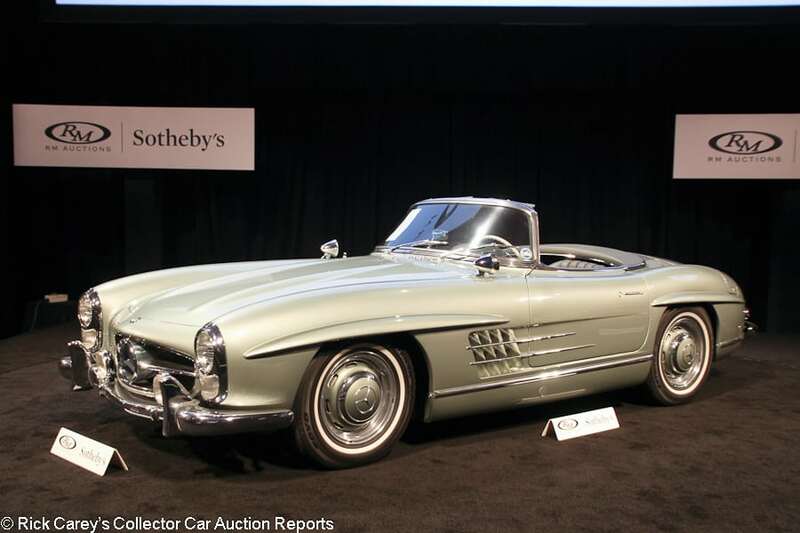 Lot # 213 1960 Mercedes-Benz 300SL Roadster; S/N 1980421000061; Engine # 19898010002602; Light Green Poly/Green leather; Estimate $1,100,000 – $1,300,000; Older restoration, 2 condition; With Reserve; Hammered Sold at $1,100,000 plus commission of 10.00%; Final Price $1,210,000 – Hub caps, narrow whitewalls, dual mirrors, Becker Mexico radio, luggage, books, tools. – Originally painted red. Fully restored about 10 years ago but still looks fresh and has nothing to pick on. 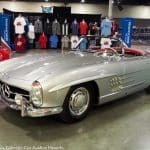 – This is a representative result for a quality older restored 300SL Roadster. 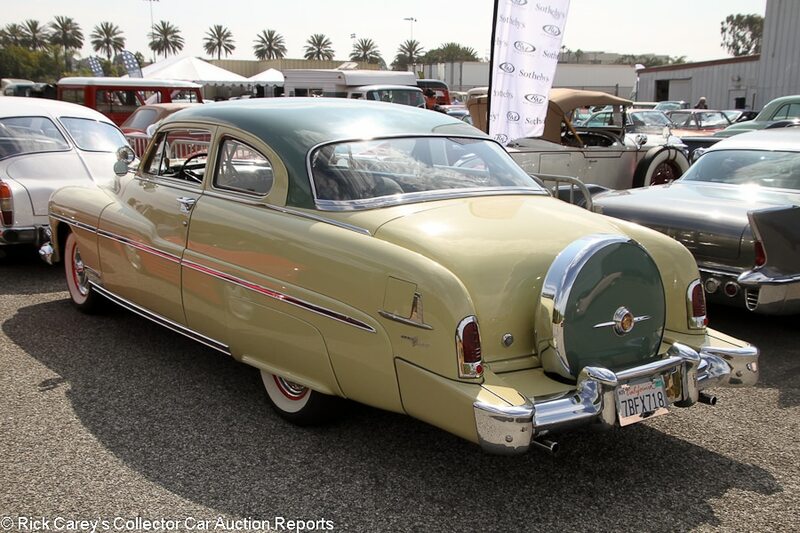 Lot # 129 1951 Mercury 1CM Club Coupe; S/N 51SL124801M; Light Yellow, Light Green roof/Green pattern cloth; Estimate $30,000 – $40,000; Older restoration, 2- condition; No Reserve; Hammered Sold at $24,000 plus commission of 10.00%; Final Price $26,400 – 255/112hp, automatic, wheel covers, whitewalls, fender skirts, dual mirrors, dual spotlights, sun shade, column shift, pushbutton radio, curb feelers, Continental kit. – Light scratches on the front bumper, but the older chrome and brightwork is still shiny. Good paint other than chips and cracks at the back of the hood. Chips at the back of the driver’s door, which doesn’t quite fit flush with the body. Very good, lightly worn interior. A lightly used older restoration that was well done to begin with. – Reported bid to $31,000 here a year ago and not sold at a $26,000 high bid at Mecum Monterey two months later, but let go here at no reserve for similar money. The price is slightly favorable to the buyer but still reasonable. 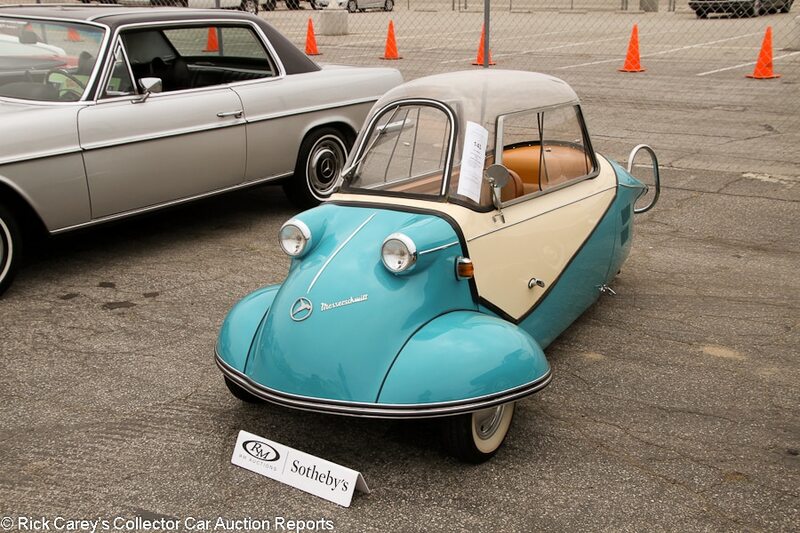 Lot # 143 1955 Messerschmitt KR175 Bubble Top; S/N 1669853; Teal, Beige/Brown vinyl piped in Red; Estimate $40,000 – $50,000; Older restoration, 2- condition; With Reserve; Not sold at Hammer bid of $32,000 – Bubble canopy, whitewalls. – Original bubble top is in mostly good shape but the gaskets are worn. Good paint other than a chip in the nose. The badge on the nose doesn’t fit flush with the bodywork. Good interior. Restored, but to microcar standards. – Bought at B-J in Scottsdale in 2010 for the excessive sum of $44,000 then sold at Barrett-Jackson Las Vegas last year for $28,600. In this condition t’s not worth any more than the reported high bid and should have gone to a new home at this price. 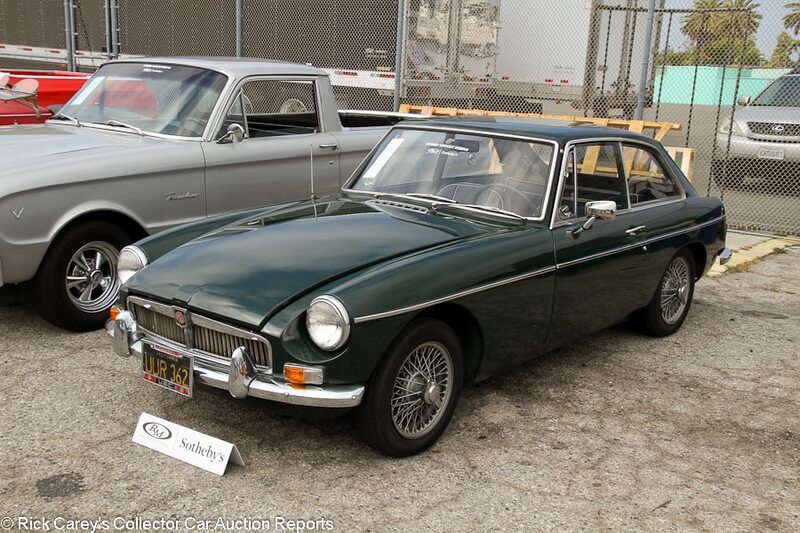 Lot # 279 1967 MG B GT Coupe; S/N 67GHD3L121494; British Racing Green/Black vinyl piped in White; Estimate $10,000 – $15,000; Cosmetic restoration, 3 condition; No Reserve; Hammered Sold at $5,500 plus commission of 10.00%; Final Price $6,050 – Painted centerlock wire wheels, Potenza tires, BMC radio. – The engine bay is unrestored and a bit shabby but maintained. There is a small dent in the hood. Decent older respray. The doors aren’t flush. The window frames are lightly pitted. Dull bumpers. Crudely undercoated chassis. Paint is coming off the wheels. Interior is mostly restored and good. An honest, presentable B GT that has gotten a decent amount of attention but never been fully apart. – This looks like a fun little car and goes to show that attractive and serviceable classics can still be had for temptingly low prices. B GTs are affordable in general, but this one was even more of a bargain and could have brought another grand or two and still been reasonable. 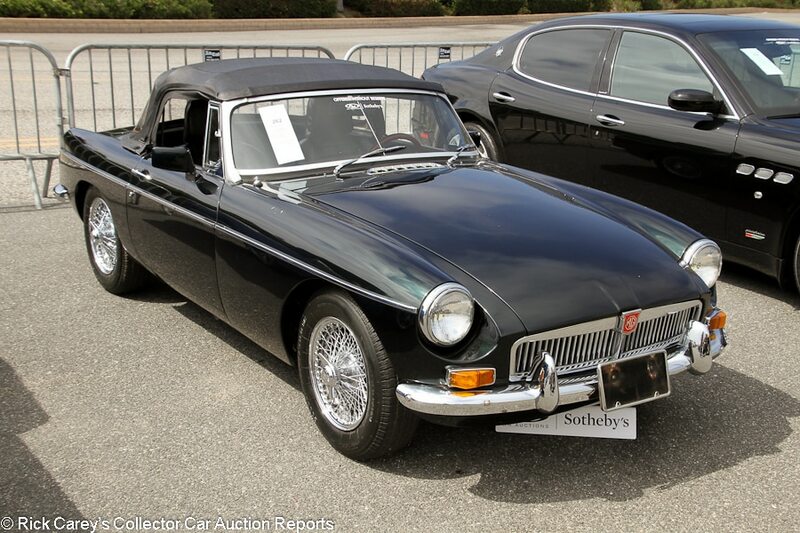 Lot # 262 1968 MG B Mk II Roadster; S/N GHN4U155340G; Dark Metallic Green/Black vinyl; Black vinyl top; Estimate $10,000 – $15,000; Cosmetic restoration, 3 condition; No Reserve; Hammered Sold at $5,600 plus commission of 10.00%; Final Price $6,160 – Chrome centerlock wire wheels, Mountney steering wheel, wood shift knob, later Clarion stereo. – Looks great from a short distance but it’s no prize up close. The engine bay is complete and looks maintained but it’s unrestored and there are cobwebs. Several small scratches on the hood and front fenders. A few blisters at the back of the hood. The metallic paint finish itself, though, is good with even flake. Very good chrome. The top is good other than drying out at the edges of the rear window. There are small cracks in the taillight lenses. Good newer seats. Cloudy original gauges. Lightly worn original dash. Unrestored but tidy underbody. An attractive driver, but no show car. – Although the cobwebs in the engine bay suggest that this car may need a bit of sorting before being road-worthy, it’s a solid example with no serious needs and it was bought for barely more than project car money. Like several of the other British sports cars in the sale, this was a bargain. 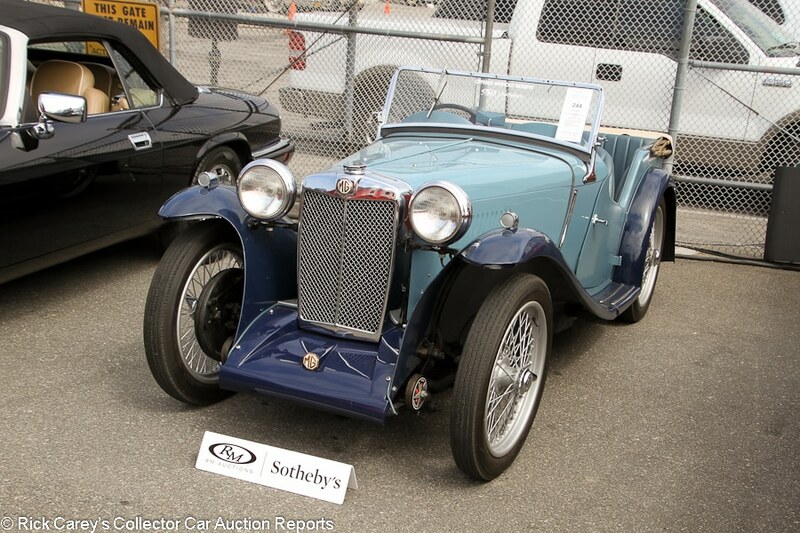 Lot # 244 1934 MG PA Roadster; S/N PA1438; Light Blue, Dark Blue/Blue; Estimate $50,000 – $70,000; Older restoration, 2- condition; No Reserve; Hammered Sold at $26,000 plus commission of 10.00%; Final Price $28,600 – Painted centerlock wire wheels, rear-mounted spare, wood dash, banjo steering wheel. – Lightly worn but restored underbody and lightly run engine bay. Very good older paint, although there is a scratch behind the driver’s door and a bit is chipping off around the door hinges. The interior is very good, as are the wheels. 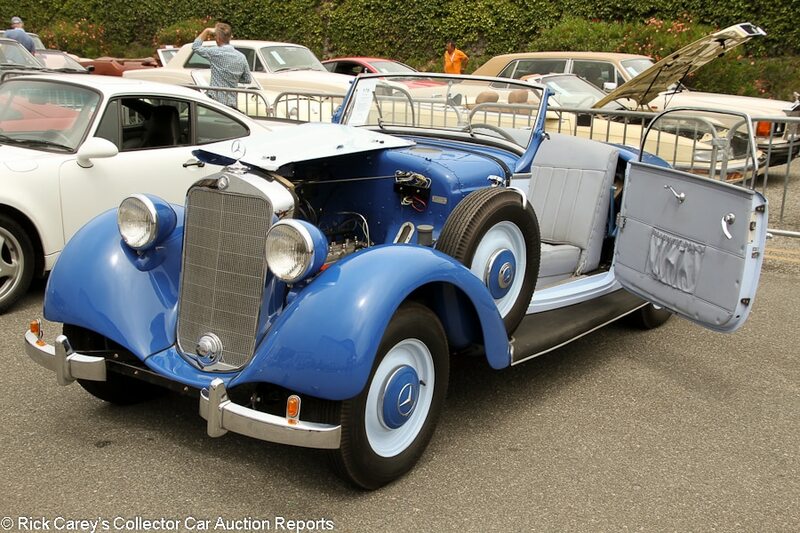 A neat, charming little four seat prewar sports car in attractive colors. Lovingly restored a while ago and enjoyed since. – This was barely T-Series money paid for a much rarer and more desirable prewar model. A great buy. Lot # 121 1985 Nissan President Sovereign Sedan; S/N H252014983; Black/Gray cloth; Estimate $18,000 – $25,000; Unrestored original, 2- condition; No Reserve; Hammered Sold at $10,500 plus commission of 10.00%; Final Price $11,550 – Wheel covers, narrow whitewalls, wing mirrors, bucket seats, console, column shift, power windows. – Dull old paint and brightwork but nothing is bad. Very good interior that almost looks new. Light road wear underneath. Showing 47,103 km, which is believable. Rarely seen example of Nissan’s flagship model. Like a Japanese Cadillac. – Some JDM cars are cool simply because we don’t see them very often on this side of the Pacific and some are doubly cool because of their level of performance that we were denied here in the U.S. for so many years. This car is neither particularly attractive nor particularly fast, which partly explains this price that was well below RM’s seemingly reasonable estimate. Even so, it’s a prestige model very rarely seen in this country, and that arguably makes it a pretty good value. 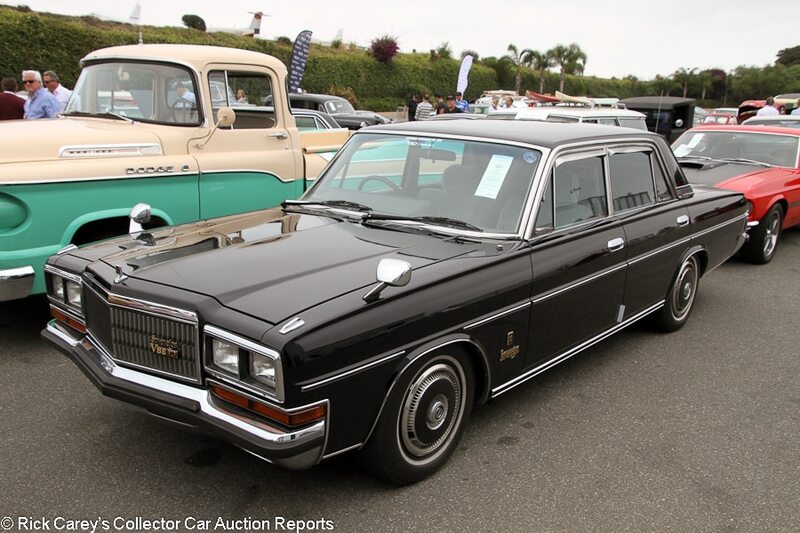 A similar JDM flagship – a 1988 Toyota Century (Lot 266) – sold for even cheaper at $4,950. Auctions America got $13,200 for a similar Nissan President at Ft. Lauderdale earlier this year, so this result cannot have been unexpected. 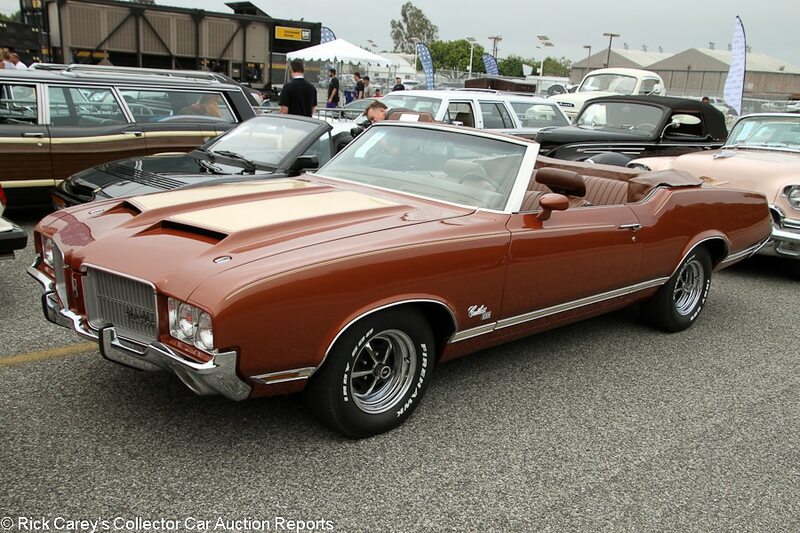 Lot # 169 1971 Oldsmobile Cutlass Supreme SX Convertible; S/N 342671M102588; Kashmir Copper/Brown vinyl; Estimate $40,000 – $50,000; Recent restoration, 2 condition; With Reserve; Not sold at Hammer bid of $32,500 – 455/320hp, 4-speed, Brown vinyl boot cover, bench seat with armrest, Hurst shifter, pushbutton 8-track radio, woodgrain interior trim, power steering, power brakes, tilt steering column. – Very good paint, chrome and interior. Factory gaps. Fender lips don’t quite fit straight. Tidy underneath with nearly spotless detailed engine bay. Fully restored relatively recently and enjoyed lightly since. – Sold at Auburn Spring in 2014 for $40,700 and worth no less than that today. 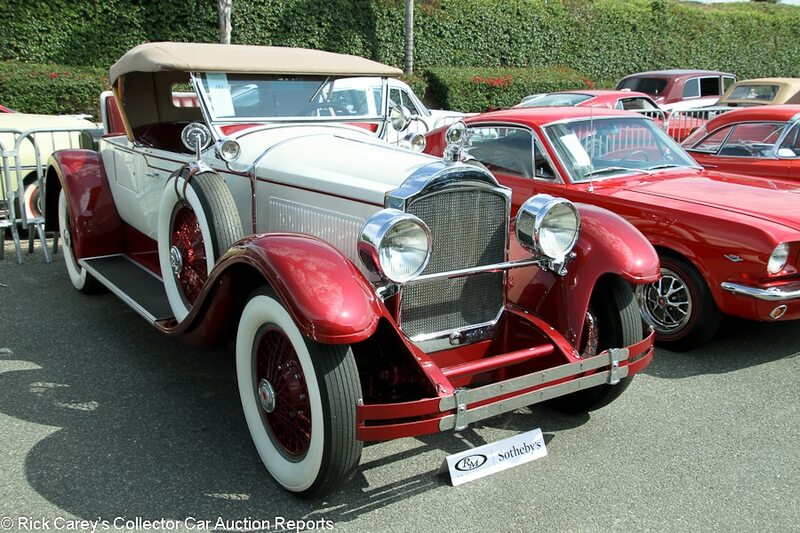 Lot # 183 1928 Packard 533 Six Runabout; S/N 143707; White, Garnet Red/Red leather; Tan cloth top; Estimate $95,000 – $105,000; Older restoration, 2- condition; With Reserve; Not sold at Hammer bid of $70,000 – Fender color painted wire wheels, Lester whitewalls, Goddess of Speed mascot, Boyce MotoMeter, spotlight, dual sidemount spares with mirrors, golf bag door, rumble seat, luggage trunk, wood steering wheel. – CCCA Full Classic (TM). Good older paint but there are a few touch ups on the edges of the doors and imperfect masking along the red coach line. There is also a light but long scratch on the tail. The red painted chassis is nearly spotless and the interior looks great, although the gauges are unrestored. Not a concours car, but an attractive smaller Packard to use on tour events or enjoy casually without obsessing over its appearance. – Built on the 133 inch wheelbase chassis, this Packard is a gentleman’s express. Low and sleek, it embodies the lifestyle of the Roaring Twenties. The reported high bid here inaccurately recognizes both the car’s quality, its style and the quality of its older restoration, even if the colors are dated. 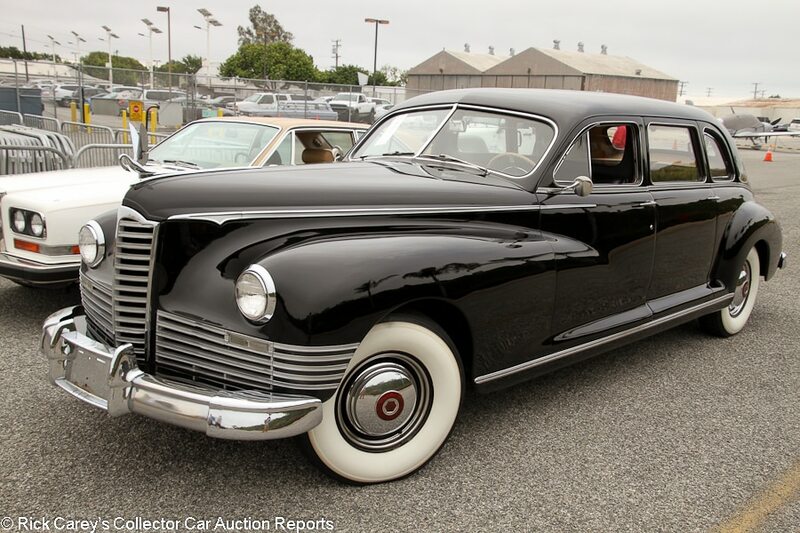 Lot # 155 1946 Packard Custom Super Clipper Limousine; S/N F502724; Black/Black vinyl in front, Tan cloth in back; Estimate $30,000 – $50,000; Visually maintained, largely original, 2- condition; With Reserve; Hammered Sold at $27,000 plus commission of 10.00%; Final Price $29,700 – 3-speed, hub caps and trim rings, wide whitewalls, Cormorant mascot, column shift, division window, dash clock, robe rail, jump seats. – Largely original but repainted. Rub through above the rockers and in between the doors. The original chrome is tired. The interior is very good. The hub caps are dinged up but presentable. The door gaps are very slightly uneven. A beautiful car design-wise and in solid preserved driver condition. It has reportedly received preservation-class awards in the past. – Sold here last year for $39,600, an outrageous price that is put right in this transaction. Lot # 267 1932 Packard Eight 5-Passenger Sedan; S/N 543300; Maroon, Black/Dark Gray cloth; Estimate $30,000 – $40,000; Older restoration, 3 condition; With Reserve; Not sold at Hammer bid of $19,500 – 319/110hp, 3-speed, blackwalls, disc wheels, Adonis radiator mascot, dual mirrors, suicide rear doors, rear-mounted spare, robe rail. – Rough, thick paint with numerous chips and scratches as well as a few small dents in the fenders. Chassis is tidy and was undercoated at some point. Interior is very good. Uneven door gaps. Lightly scratched rear glass. Dry, cracking old Goodyear tires. Tidy older restored engine bay. This car is pretty tired, although you could enjoy it as is, as it is also reported to be fully sorted mechanically. On the other hand, it’s a solid, straight candidate for a thorough restoration. 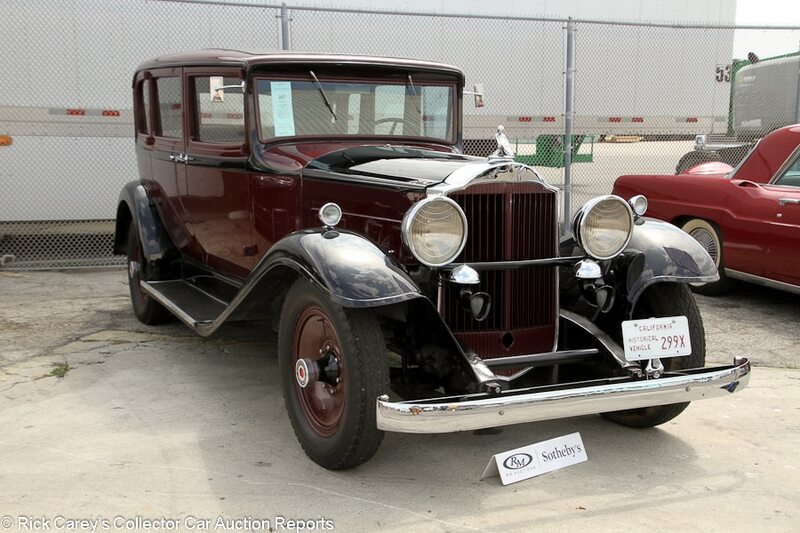 – The bidders apparently didn’t find the “wonderful patina” of this standard Eight appealing even though it is a CCCA Full Classic ™ and thus eligible for many events. It would be a fine way to experience quality Depression era motoring at reasonable cost, even for a few dollars more than the reported high bid. 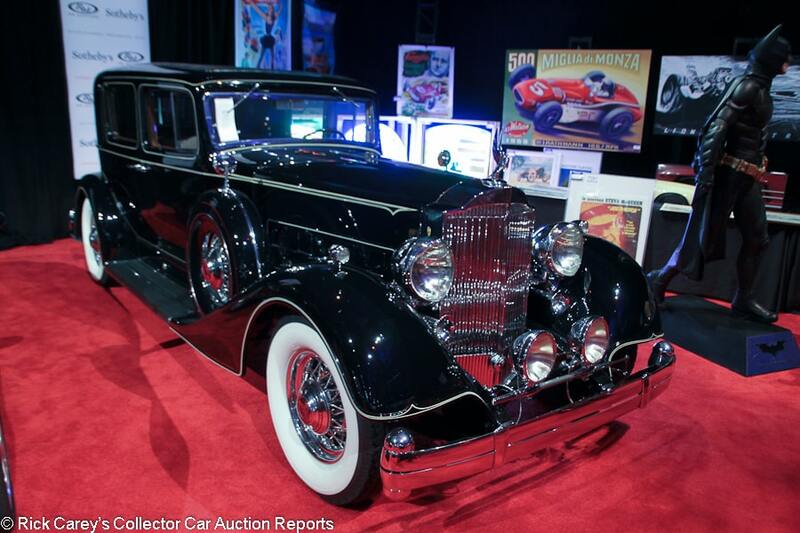 Lot # 211 1934 Packard Twelve-Series 1107 Club Sedan; S/N 73637; Black, White coach line/Gray cloth; Estimate $185,000 – $225,000; Concours restoration, 1- condition; With Reserve; Not sold at Hammer bid of $150,000 – Wire wheels, Firestone wide whitewalls, dual enclosed sidemount spares with mirrors, Cormorant mascot, Pilot Ray lights, dual chrome horns, suicide rear doors, wood interior trim, luggage trunk, robe rail, interior courtesy lights, running board lights. – Chips at the back of the right rear door. Pretty much spotless underneath. Still showable. Body-off restored in 2012 and shown at Pebble Beach that year. Riding on wire wheels for tours, comes with a set of original style wood spoke wheels for shows. – Lavishly and luxuriously equipped, but even then it must have been hard to sell a Packard Twelve in 1934, which is why Packard shipped only 960 in all body styles. This is a gorgeous restoration still more than good enough to show proudly at the end of a day’s touring. The reported high bid reflects the restoration’s quality, but also the closed Club Sedan coachwork, and isn’t unreasonable. 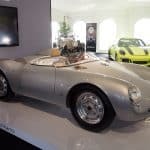 Lot # 224 1960 Porsche 356B 1600 Super Convertible D, Body by Drauz; S/N 88222; Ruby Red/Tan; Tan top; Estimate $175,000 – $210,000; Recent restoration, 2 condition; With Reserve; Hammered Sold at $155,000 plus commission of 10.00%; Final Price $170,500 – 1582/60hp, chromed reproduction centerlock wheels, tan cloth tonneau cover, woodrim steering wheel, Blaupunkt pushbutton radio, gold brightwork, Porsche CoA. – Represented as matching numbers. Very clean engine bay other than some fuel coming down from the carbs. Very good paint. The trim is straight and the gaps are even. Very good, lightly worn interior. Fully restored in 2013 to high standards. – Sold at Worldwide Auburn in August 2013 for $182,500 fresh from restoration then five months later at RM in Arizona for $198,000, which was huge money at the time and probably closer to what this car deserves today, but this result is still close enough for the seller to be reasonably happy with. 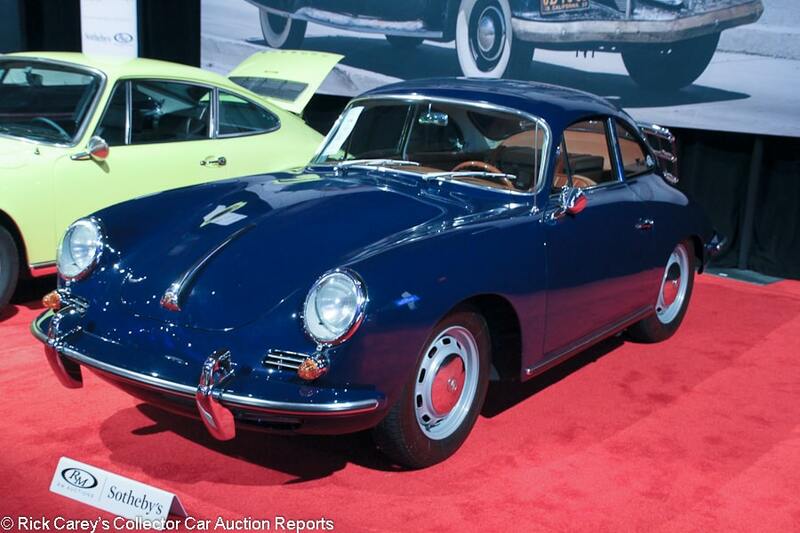 Lot # 176 1964 Porsche 356C 1600 Coupe, Body by Reutter; S/N 129361; Bali Blue/Brown; Estimate $100,000 – $125,000; Older restoration, 2 condition; With Reserve; Hammered Sold at $117,000 plus commission of 10.00%; Final Price $128,700 – 1,582/75hp, hub caps, luggage, luggage rack, sunroof, gold brightwork, Nardi woodrim steering wheel, Blaupunkt pushbutton radio. – Very good older paint and chrome. Very good interior. The right interior courtesy light doesn’t work. Tidy underneath. Not done yesterday, but it’s still gorgeous and doesn’t need anything. This car started the restoration process in 1980, but it took 21 years at the hands of the owner, who took care to make sure everything was correct. It presents like a car with a fresher restoration and comes with a Porsche CofA, owner’s manual, jack, tool kit and spare. 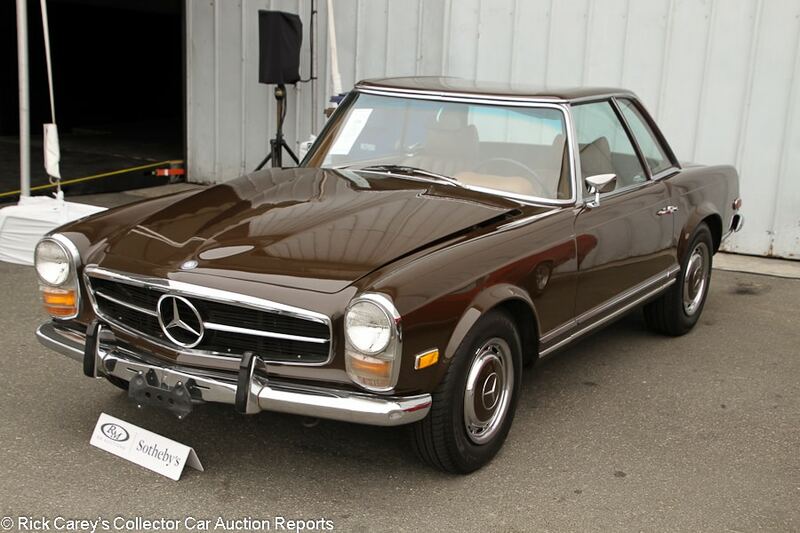 – This is big money for a 1600 C coupe, but this car deserved it. The quality of the work was very high, and it’s still a gorgeous example. 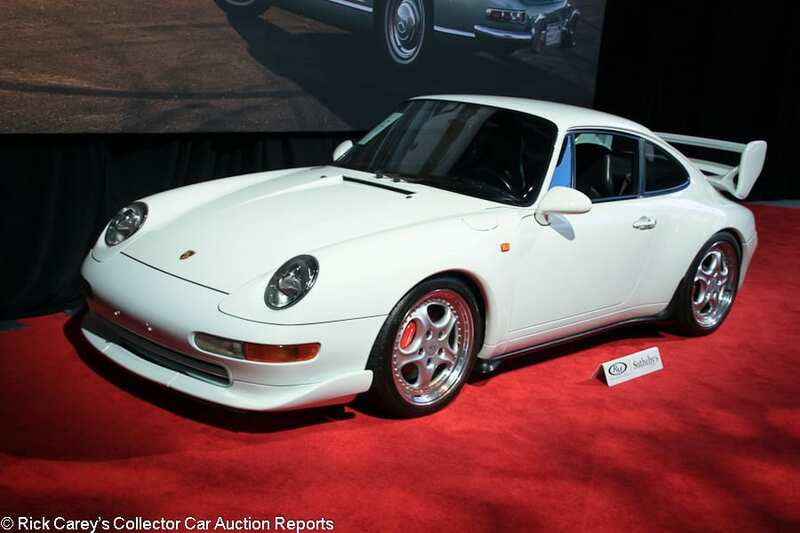 Lot # 230 1995 Porsche 911 Carrera RS Coupe; S/N WP0ZZZ99ZTS390669; Grand Prix White/Black leather with Gray inserts; Estimate $450,000 – $550,000; Unrestored original, 2 condition; With Reserve; Hammered Sold at $395,000 plus commission of 10.00%; Final Price $434,500 – Modular wheels, red calipers, cross-drilled rotors, wing, front spoiler, factory cassette stereo, air conditioning, power windows. – Other than very light wrinkling to the seats, it looks like a new car and is showing 24,534 km, consistent with its presentation. – Porsche only built a little over 1,000 examples of these lightweight 993s, and they were never officially sold in the United States, although a few made their way here. As with all 911 models, when the weight goes down the price goes up, and this result was in line with what other similar cars have sold for recently. 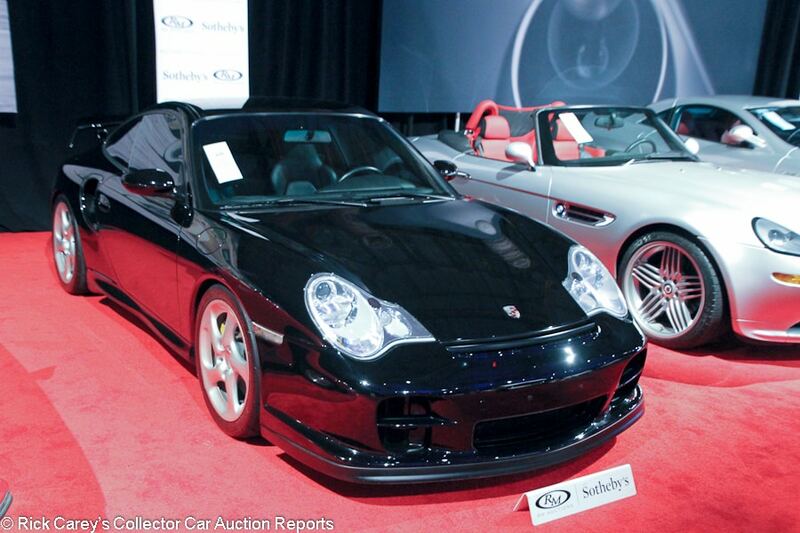 Lot # 220 2002 Porsche 911 GT2 Coupe; S/N WP0AB29942S696171; Black/Black leather; Estimate $140,000 – $160,000; Unrestored original, 2 condition; With Reserve; Not sold at Hammer bid of $120,000 – Tinted glass, carbon ceramic brakes, adjustable suspension. – Showing 16,464 miles claimed original but looks like a new car other than some wrinkling to the driver’s seat. – This is the most desirable model of the 996 generation, but the 996 in general still suffers from the disapproval of many Porsche purists. Even though the GT2 is an awesome machine, it’s still worth less than the equivalent models that came both before and after. This wasn’t a generous offer for one, but it was fair. 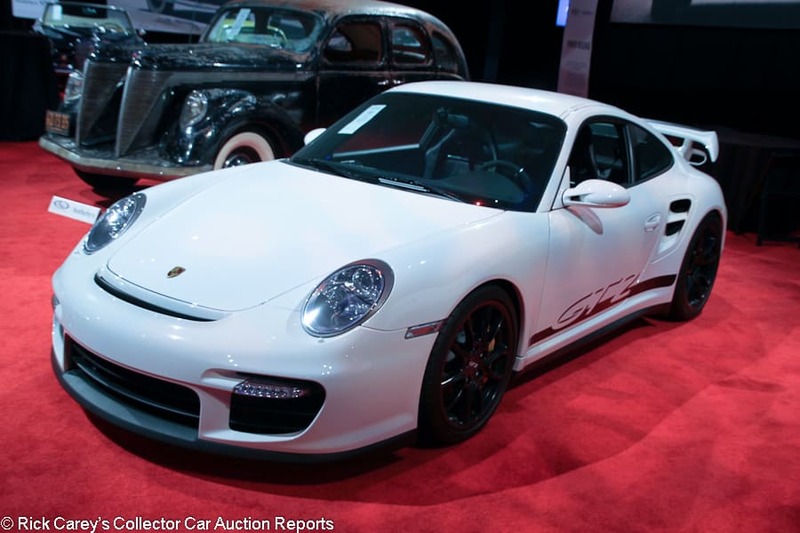 Lot # 227 2008 Porsche 911 GT2 Coupe; S/N WP0AD29948S796175; Carrera White, Black graphics/Black leather with suede inserts; Estimate $270,000 – $310,000; Unrestored original, 2 condition; With Reserve; Not sold at Hammer bid of $240,000 – 3,598cc/530hp twin turbo, 6-speed, Michelin Pilot Super Sport tires, yellow calipers, carbon ceramic brakes with cross-drilled rotors. – It may be 10 years old, but it looks like a new car. Clearly treated as a collectible from day one and represented with 8,000 miles. – As limited-production, high-performance 911 models, GT2s are considered collectible pretty much as soon as they roll out of the factory, but an offer of 240 grand for a car that had an MSRP of less than 200 seems like a fair one. 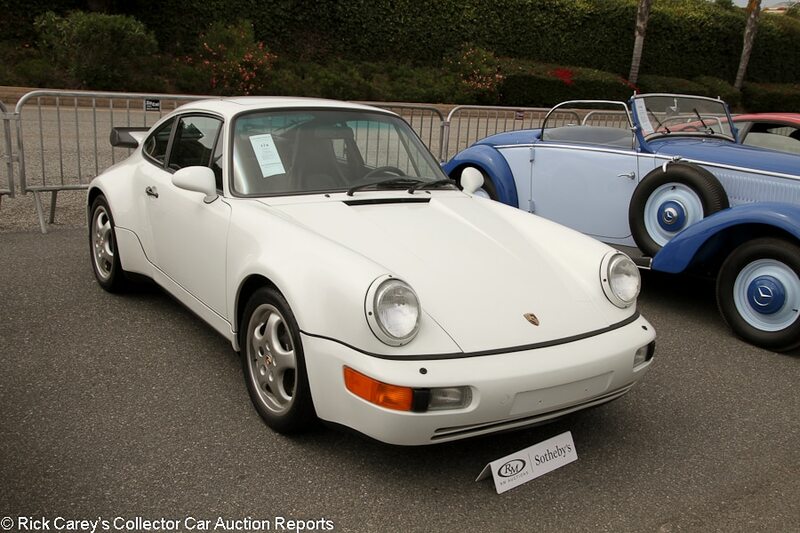 Lot # 174 1991 Porsche 911 Turbo Coupe; S/N WP0AA2961MS480273; Grand Prix White/Black; Estimate $80,000 – $110,000; Unrestored original, 2- condition; With Reserve; Hammered Sold at $83,000 plus commission of 10.00%; Final Price $91,300 – 3.3/300hp, 5-speed, limited slip, factory sunroof, whale tail, cross-drilled rotors, power windows, air conditioning, later Alpine CD stereo. – The wheels are lightly scratched. Small chip on the hood but otherwise very good original paint. Very lightly worn interior. Showing 54,659 miles, but well kept along the way and are appropriate to its condition. – Earlier 964 Turbos used a revised version of the 3.3-liter unit from the 930 and are worth significantly less than the later 3.6-liter 964 Turbos, but this is still a bargain that wouldn’t have been particularly expensive even at a six-figure price. 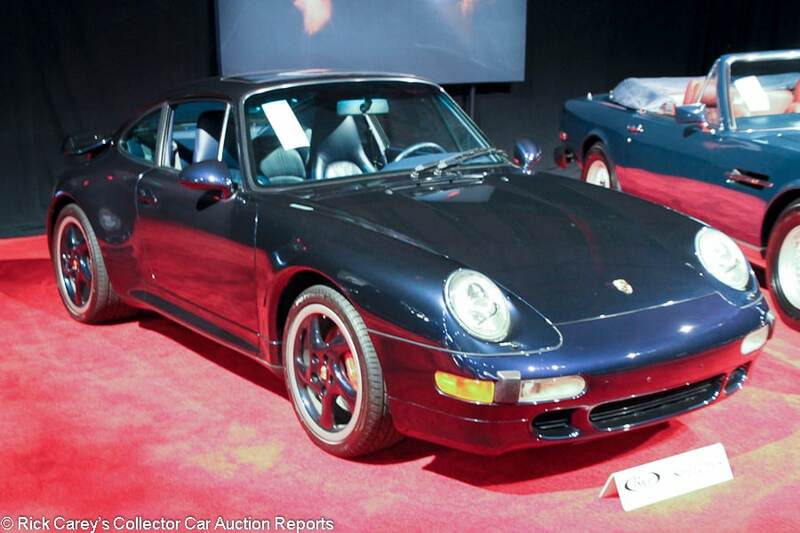 Lot # 192 1996 Porsche 911 Turbo Coupe; S/N WP0AC2997TS376230; Midnight Blue Metallic/Dark Blue leather; Estimate $165,000 – $185,000; Unrestored original, 2 condition; With Reserve; Not sold at Hammer bid of $137,500 – 3.6/400hp twin turbo, body color wheels, red calipers, sunroof, clear bra on the nose, factory stereo, optional Porsche cell phone, power heated front seats. – Comes with service records. Showing 24,808 miles. Both of the front seats are fairly wrinkled, but otherwise this is a babied 911 that almost looks like a new car. – Hammered at Mecum Monterey 2016 at a $155,000 bid, then again at Mecum Dallas in November at a $130,000 high bid, then again at Worldwide Dallas this April at a $120,000 high bid. The consignor really isn’t unreasonable to expect more for a maintained example in this condition, but with four unsuccessful trips across the block in such a short time there is a message that isn’t being read. It may be time to sell before the bidders go sour on it. 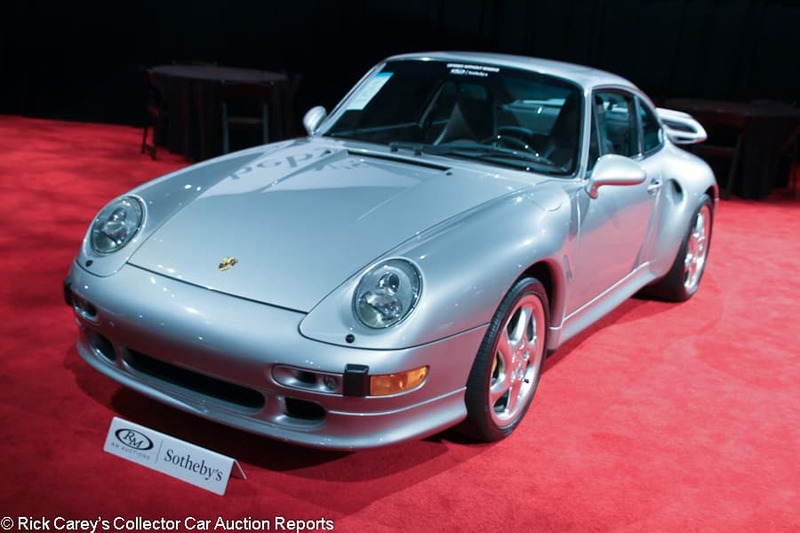 Lot # 217 1997 Porsche 911 Turbo S Coupe; S/N WP0AC2994VS375734; Arctic Silver Metallic/Gray leather; Estimate $225,000 – $275,000; Unrestored original, 2- condition; No Reserve; Hammered Sold at $200,000 plus commission of 10.00%; Final Price $220,000 – Turbo twist wheels, yellow calipers, cross-drilled rotors, Pirelli P Zero tires, carbon fiber interior trim, white face gauges, factory cassette stereo. – This is the North American model, which had 25 fewer horsepower. Lots of rock chips on the nose. Small scratch behind the driver’s door, one on the left rear fender and another on the rear wing. Otherwise very good original paint. Seats show wear corresponding to the 66,979 miles showing, and the rest of the interior is spotless. This car has been enjoyed plenty, but it was still very well cared for in the process. – The Turbo S version of the 993 had extra power and extra carbon fiber compared to the standard Turbo, and only 345 were built. Die-hard Porsche collectors are going to want a car with no miles that looks showroom fresh, which is not how you would describe this example. That said, it’s not a bad car and deserves a lot more than this result, but this is what can happen when you sell a car at no reserve. Other recent Turbo S results at auction have been in the 300-400 grand range, so for someone who actually wants one of these cars to drive and enjoy, this was a serious bargain. 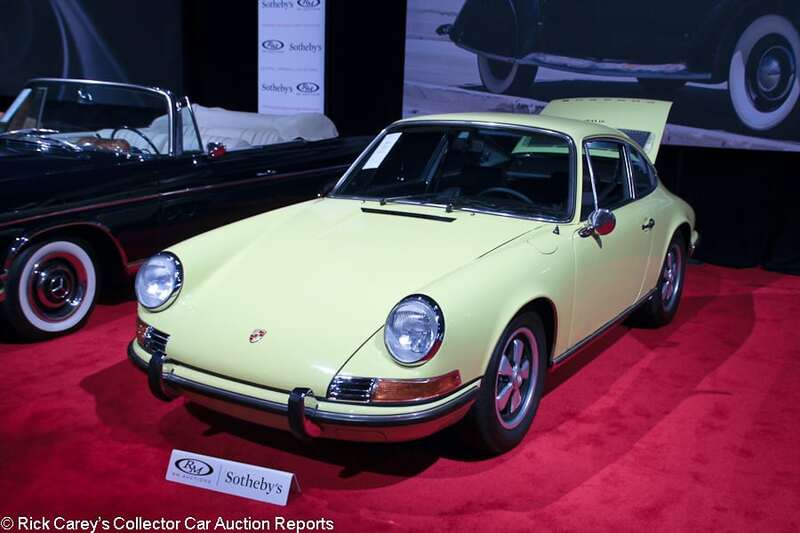 Lot # 231 1971 Porsche 911S Coupe; S/N 9111300023; Hellgelb (Bright Yellow)/Black; Estimate $150,000 – $180,000; Recent restoration, 2 condition; With Reserve; Not sold at Hammer bid of $90,000 – Fuchs wheels, gold brightwork, Blaupunkt pushbutton radio. – Very clean engine bay. Very good paint and brightwork. Like new interior with restored gauges. Freshly restored top to bottom over three years and to like new standards without being excessive. It’s just right. – Five figures offered for a six-figure car. It deserves more, and the consignor is right to hold out. 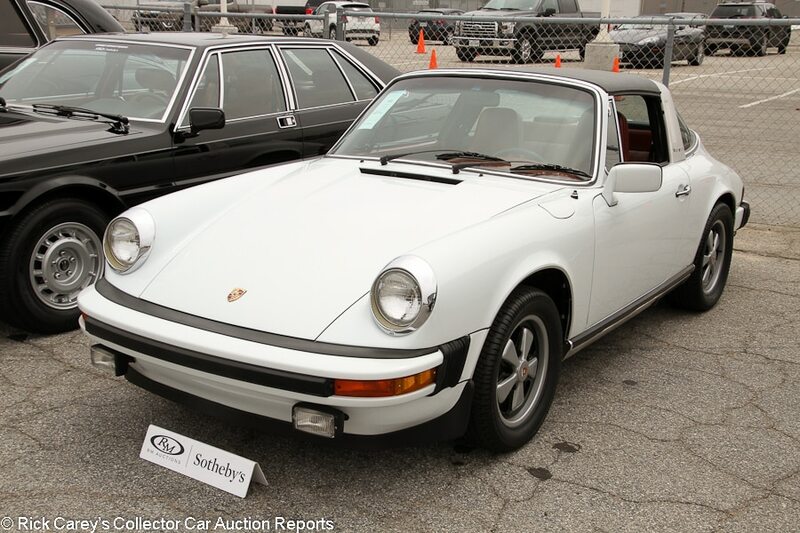 Lot # 153 1976 Porsche 911S 2.7 Targa; S/N 9116211280; Grand Prix White, Black vinyl roof/Red leather; Estimate $55,000 – $65,000; Recent restoration, 2- condition; With Reserve; Hammered Sold at $47,500 plus commission of 10.00%; Final Price $52,250 – Fuchs wheels, Pirelli tires, Blaupunkt cassette stereo, white face gauges, fog lights. – Very good paint. Very clean restored engine bay and underbody. Very good, mostly original interior. Restored in 2015 and only showing 884 test miles. Porsche CofA documented. – The mid-70s 2.7-liter 911s have traditionally been among the cheaper ways to get into a proper classic Porsche, largely because of the changes to the engine that met federal regulations but robbed power and caused heat-related problems. Few have gotten extensive or high-dollar restoration work, which makes this example pretty special. That’s the only reasonable explanation for this far above-market result. 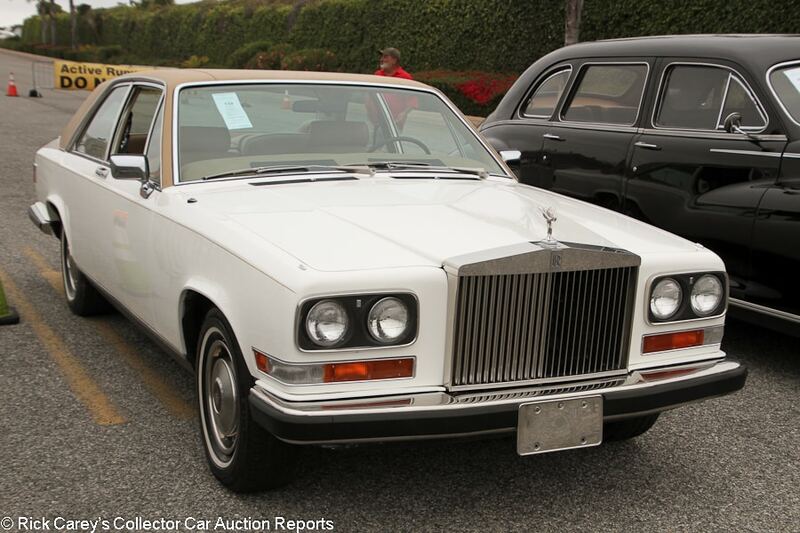 Lot # 139 1985 Rolls-Royce Camargue Coupe, Body by Pininfarina; S/N SCAYJ42A0FCX09572; White, Tan vinyl roof/Tan leather; Estimate $55,000 – $65,000; Visually maintained, largely original, 2- condition; With Reserve; Not sold at Hammer bid of $45,000 – Hub caps and trim rings, narrow whitewalls, Blaupunkt stereo, power windows, air conditioning, burled wood trim. – Recent service. Clean CARFAX. Some rub through on the hood. The grille is a bit dull. Good older repaint otherwise. The windshield gasket is cracking. The interior is original but only lightly worn and well kept. Light discoloration on the roof vinyl. Tidy and unrestored underneath. A well maintained Camargue with a basic body-on respray. Showing 52,230 miles. 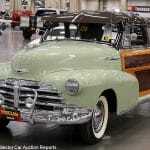 – Hammered not sold at a $40,000 high bid at Mecum Los Angeles back in February. Camargues are relatively rare, but the design was not Pininfarina’s best work to put it lightly and both offers for this car were perfectly fair. 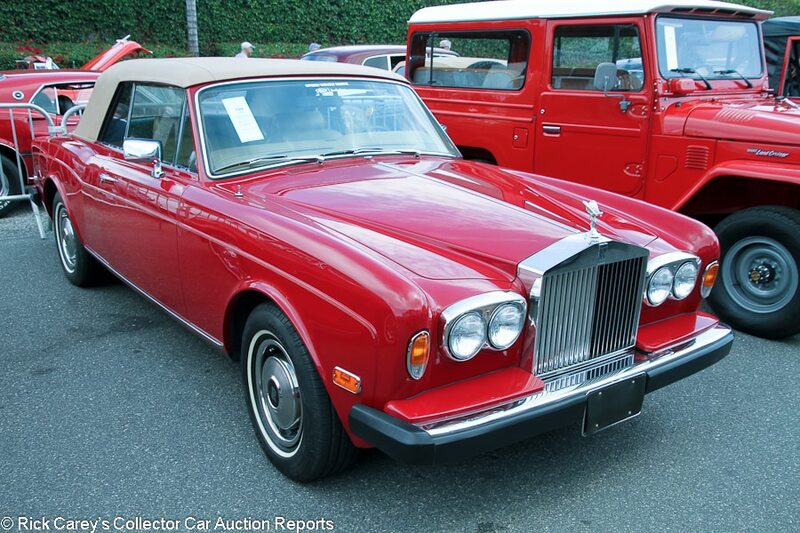 Lot # 199 1983 Rolls-Royce Corniche I Drophead Coupe; S/N SCAZD42A6DCX07088; Red/Tan leather; Tan vinyl top; Estimate $65,000 – $75,000; Unrestored original, 2- condition; No Reserve; Hammered Sold at $51,000 plus commission of 10.00%; Final Price $56,100 – Hub caps and trim rings, narrow whitewalls, power windows, air conditioning, Blaupunkt cassette stereo. – Represented as a one-owner car with all of its scheduled service. 12,273 miles. A few small paint cracks around the hood and below the windshield. Two more small cracks below the left quarter window. Otherwise the original paint is shiny and well kept. The seats are showing their age but the interior has clearly been cleaned on a regular basis. The underbody isn’t quite as pretty as on top. There is a lot of road wear and dirt under there. A used Rolls, but for the most part a very well kept one. – This was an expensive buy, especially for a car with cosmetic shortcomings, but if it has indeed been consistently and correctly serviced, it may save the new owner money in the long run. Lot # 142 1971 Rolls-Royce Phantom VI Limousine; S/N PRH4609; White, Burgundy above the coach line/Black leather piped in red up front, Green cloth in back; Estimate $85,000 – $95,000; Unrestored original, 3- condition; With Reserve; Not sold at Hammer bid of $50,000 – Brass Spirit of Ecstasy radiator mascot, wing mirrors, power windows, tinted windows with darker tint in back, burled wood dash and door trim, dash clock, power division window, interior courtesy lights, Clarion cassette stereo, barometer and Angelus dash clock set into the wood just below the division, Philips 45 vinyl player in rear, wood TV cabinet with Sony television, window curtains, telephone and bar, jump seats, another Clarion cassette in rear. – Weak paint with long cracks throughout. Paint is chipping heavily on some of the burgundy parts. Poor panel fit. Big touch up beside the right headlight. Worn leather in front. Excellent wood. The cloth is very good. 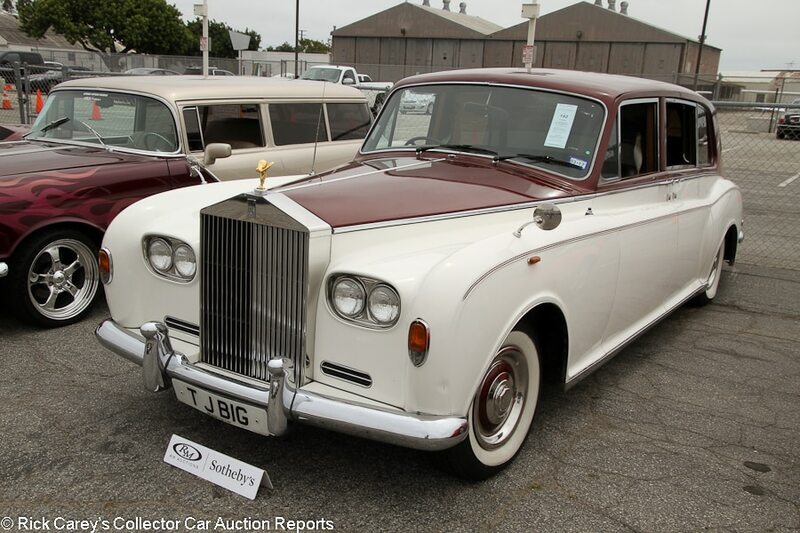 The seemingly endless list of equipment and luxuries as well as the suggestion of Hollywood celebrity ownership set this otherwise shabby vintage Rolls apart, although most of the special features are very dated technology. Usable to arrive in style and impress your friends, but won’t go anywhere near a show field. – Sold for $53,900 at Russo and Steele Scottsdale in 2015, then hammered not sold here on a reported bid of $70,000 a year ago. Also unsold at a $50,000 high bid at Mecum Anaheim last year. This unusual car was represented in Scottsdale and in the catalog for this sale as having been delivered to Tom Jones, but RM later retracted that claim. That doesn’t necessarily affect the price all that much, though, and the market has now spoken three times with very similar bids. The seller must be looking wistfully at whatever bidding brought the $70,000 a year ago; even if the chandelier was high bidder there probably was money just below it, an opportunity squandered. 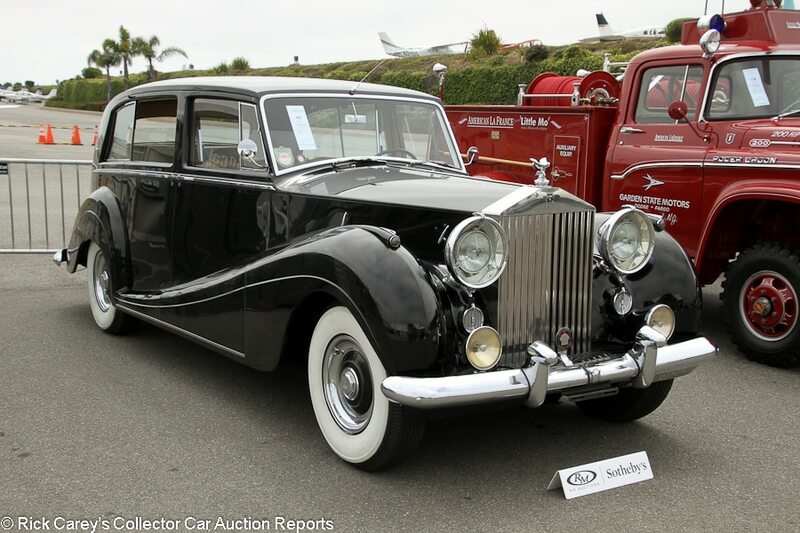 Lot # 161 1953 Rolls-Royce Silver Wraith 4-Dr. Sedan, Body by HJ Mulliner; S/N LBLW8; Black/Beige leather; Estimate $85,000 – $110,000; Older restoration, 3+ condition; With Reserve; Hammered Sold at $75,000 plus commission of 10.00%; Final Price $82,500 – Wheel covers, Firestone wide whitewalls, Spirit of Ecstasy, Lucas driving lights, dual mirrors, suicide rear doors, division window, aftermarket air conditioning in the back. – The chrome and brightwork are sound but the paint is dull with small touch ups on the nose and around the door hinges. The body sides are not totally straight. The interior is in very good shape other than mild discoloration on the rear cloth seats. The tires are dirty and there is light road wear underneath. An attractive car that only shows big imperfections when you’re really looking for them. It could be a good event car, but for any shows it will need another round of restoration work. This car has three Pebble Beach wins in the 1970s to its credit, but it hasn’t gotten any serious restoration work since then nor is it particularly well maintained. – The Hagerty Price Guide calls these coachbuilt Silver Wraiths “visually challenged” and one look at the photo explains why. Its show awards are now forty years old. The seller should be highly satisfied with this generous result. 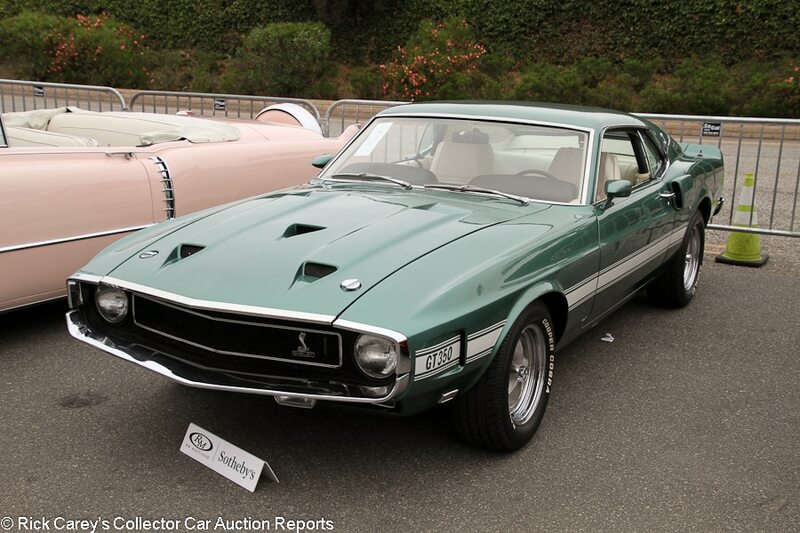 Lot # 179 1969 Shelby Mustang GT350 SportsRoof; S/N 9F02M480675; Silver Jade, White/White vinyl; Estimate $65,000 – $75,000; Cosmetic restoration, 3+ condition; With Reserve; Not sold at Hammer bid of $54,000 – 351/290hp, 4-speed, Shelby wheels, Cooper Cobra tires, dash clock, console, pushbutton radio. – Represented as matching numbers. Hood gaps are uneven. Dull chrome. Paint bubbles around the hood vents. Gloppy paint in the drip rails. Restored underbody. The engine has been maintained and well kept, but it doesn’t look like it’s ever been fully apart. Light pitting on the window frames. Some light wear and discoloration on the seats but otherwise good restored interior. A sound but unremarkable cosmetic redo. – The reported high bid was shy of what this car is arguably worth, but not by a lot and was worth considering. Lot # 136 1959 Studebaker Deluxe NAPCO Pickup; S/N E11D13517; Cream/Brown vinyl with Tan cloth inserts; Estimate $65,000 – $85,000; Recent restoration, 2+ condition; With Reserve; Hammered Sold at $62,500 plus commission of 10.00%; Final Price $68,750 – 245/118hp, 4-speed, NAPCO 4WD conversion, mirrors, spare wheel, floor shift, pushbutton radio. – Spotless restored frame. Very good paint and chrome. Like-new interior with fully restored gauges. The bed is straight and perfect. Recently body-off restored to probably better than it ever was when new. Used as a factory demonstrator in period. – It might not appeal to the typical Ford and Chevy pickup crowd, and Studebaker enthusiasts may not be particularly into pickups. The rarity, condition and factory history, though, make this result seem light, especially when you consider that it was hammered not sold at an $80,000 high bid at Mecum Anaheim last year. A truck that is unlikely to find another like it parked alongside even at the most extensive truck show, and that exclusivity (and the exquisite restoration) is worth all the price paid here. 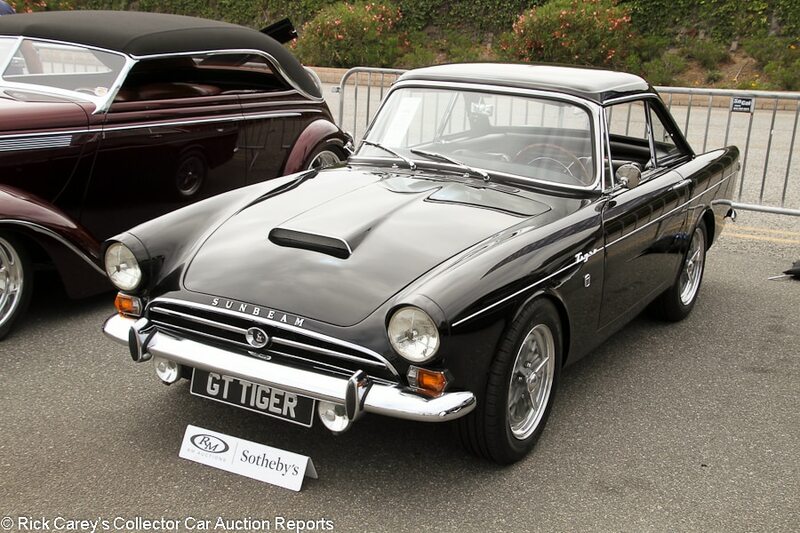 Lot # 173 1964 Sunbeam Tiger GT Convertible; S/N B9470207LRXFE; Black, Black hardtop/Black vinyl; Estimate $130,000 – $160,000; Recent restoration, 2- condition; With Reserve; Not sold at Hammer bid of $125,000 – 260/164hp, 4-speed, centerlock wheels, hardtop, hood scoop, dual mirrors, wood dashboard, wood steering wheel, dash clock. – Very clean engine bay. Very good paint, chrome and interior. Fully restored in 2015 to high but not excessive standards. Represented as matching numbers engine with later 4-speed. Reportedly one of 15 Tiger GT models produced, which included a hardtop, deleted the soft top and added some interior upgrades. – It’s hard to say what the GT configuration does to a 260-powered Tiger’s value. It may be rare, but it didn’t change the car by much and it’s not all that well known. The bidders thought very highly of it, bidding this car to a price above what even a concours-ready Mk I Tiger would bring, but both the seller’s expectations and RM’s estimate are beyond even that, which is a stretch. 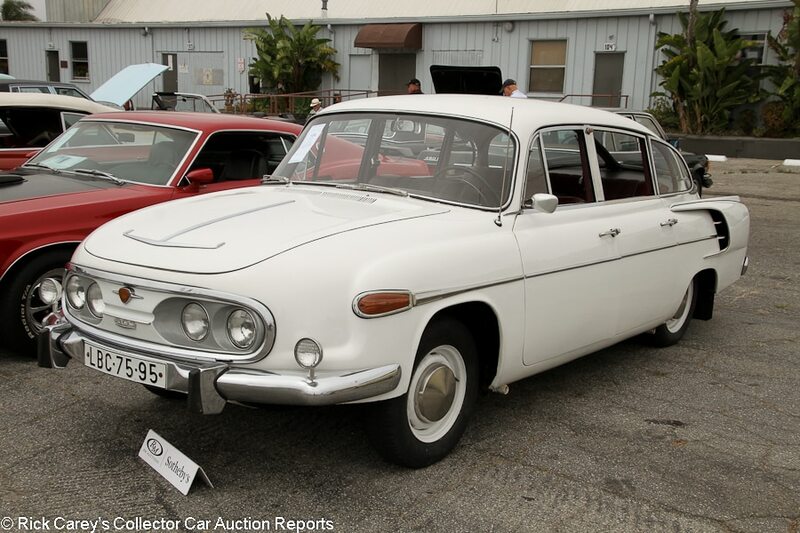 Lot # 128 1960 Tatra T603 4-Dr. Sedan; S/N BCS7989131293; White/Burgundy leather with cloth inserts; Estimate $35,000 – $45,000; Cosmetic restoration, 3 condition; With Reserve; Hammered Sold at $38,000 plus commission of 10.00%; Final Price $41,800 – 2544/100hp V8, 4-speed, hub caps, modern stereo. – Advertised as a 1960 model, but looks like a four-headlight car from later in the decade. Uneven gaps. Pitted window frames. Very dull and lightly scratched chrome and brightwork. Budget respray with masking errors around the windshield and gloppy finish around the panel edges. Newer seats and headliner. The rest of the interior is original but sound. Rusty exhaust and oxidized frame, but nothing too bad. This is not a particularly good example, but it’s a solid candidate for a restoration. – Only about 20,000 of these cars were built mostly by hand in Czechoslovakia over a 20 year period, and most went to politicians rather than the private market. They were well screwed together and had the typical Tatra layout of air-cooled hemi V-8 hung out over the rear axle, but this one was in basic driver condition and deserves better. Tatra was a recent featured class at Pebble Beach and are on more collectors’ radar than they used to be, but the supply of cars on this side of the Atlantic is still pretty thin. This price seems expensive, but the bidders can’t know when the next one is going to come along. Lot # 263 1981 Toyota FJ 43 Land Cruiser Hardtop 4×4; S/N FJ43104084; Freeborn Red, White roof/Tan leather; Estimate $45,000 – $55,000; Recent restoration, 2- condition; With Reserve; Hammered Sold at $51,000 plus commission of 10.00%; Final Price $56,100 – 2F 4.2 liter/125hp, 4-speed, rear-mounted spare, air conditioning, aftermarket stereo. 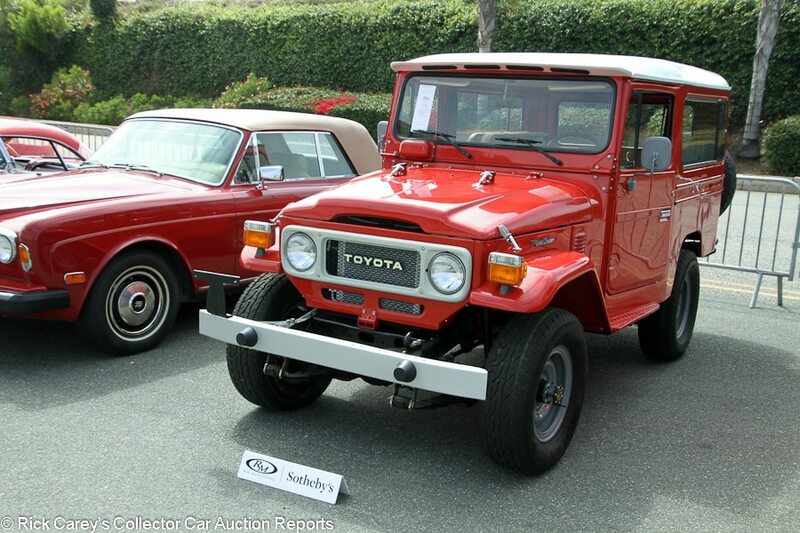 – A relatively rare medium wheelbase FJ43 model. Very clean restored chassis and nearly spotless engine bay. Wavy body sides. Lightly track scratched side windows and lightly scratched rear window. Excellent fully restored interior upgraded to leather upholstery. Scratched door handles. Restored by FJ Legends, but not over-restored like many FJs are. It’s very good, but not so good that you’d be afraid to get it dirty. – The FJ43 is a fairly rare model especially compared to the famous FJ40. The price here would have been on the very high side for a standard Land Cruiser, but for a desirable medium wheelbase model in this condition it was justified. 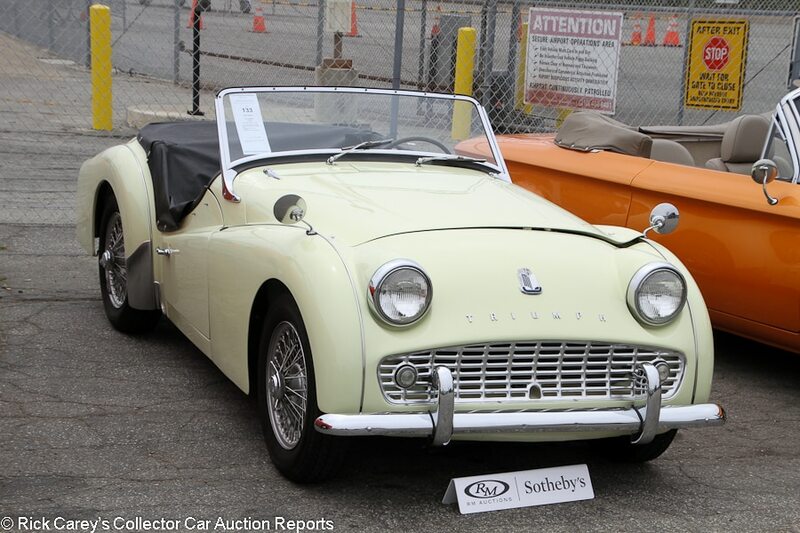 Lot # 133 1963 Triumph TR3B Roadster; S/N TCF2639L; Light Yellow/Black vinyl piped in White; Black top; Estimate $20,000 – $35,000; Older restoration, 3+ condition; With Reserve; Hammered Sold at $22,000 plus commission of 10.00%; Final Price $24,200 – Painted centerlock wire wheels, dual wing mirrors, black vinyl tonneau cover, banjo spoke steering wheel. – Represented as a body-off restoration done 10 years and 500 miles ago. Very good chrome. The paint finish is very good but there are masking errors around the grille and the body sides are also a little wavy. Paint is coming off the wheels. The interior looks old. Other than the carpets and upholstery, it is all unrestored and looks it. Lots of paint is chipping off the top frame. Well undercoated frame and clean restored engine bay. Fully done, but on a budget and not really any better than a slightly better than average driver. – The TR3B was the last and most developed of the series, and this one is more than good enough to drive around and enjoy even if it isn’t going to win any beauty contests. It was also a good buy, and could have brought another couple grand without being expensive. 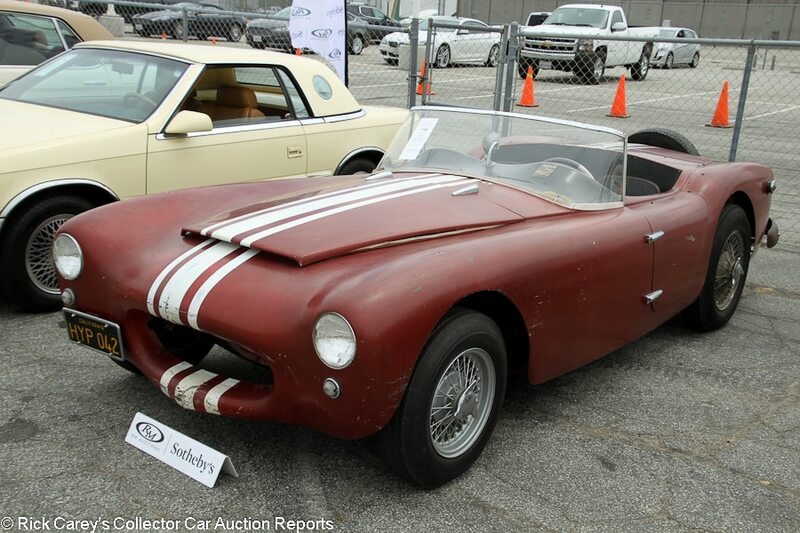 Lot # 146 1955 Woodill Wildfire Roadster; S/N 0435817F55F; Burgundy, White stripe/Black vinyl piped in Red; Estimate $50,000 – $65,000; Unrestored original, 3+ condition; With Reserve; Not sold at Hammer bid of $35,000 – Painted centerlock wire wheels, rear-mounted spare wheel, dash clock, hardtop, 296 Chevy engine with a 3-speed, although these cars often had a Willys six. – Lots of money has been spent on the engine, which looks recent and great. Otherwise, it’s an all original car and looks it. The mirrors are missing. The original or just very old paint is dull and scratched all over. There is a tear in the fiberglass right next to the grille. Uneven gaps. The seats are busted open with foam coming out. The frame is sound. Inherently interesting as one of the first fiberglass sports cars, but there is not much in the way of history represented for this example and it’s in need of restoration. – A Woodill Wildfire is not a Devin, either in style or in recognition, however the seller seemed to hold it in the same regard in turning down the reported high bid, or any money offer close to it. This is not a Preservation Woodill Wildfire, it is a restoration project Woodill Wildfire. Classy write-ups. Its rare to find this attention to detail and I appreciate it!